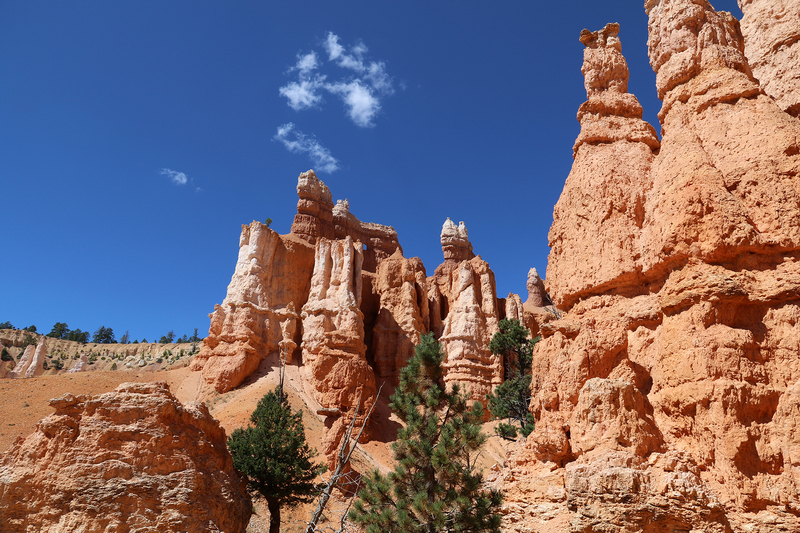 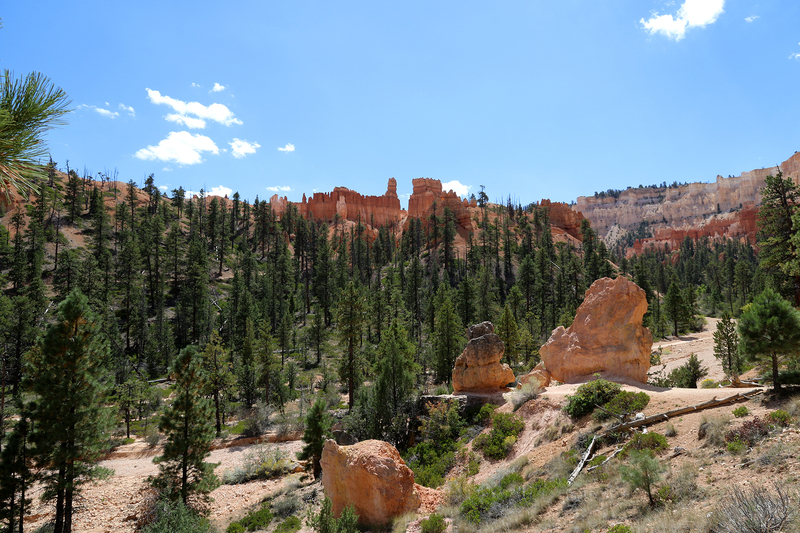 It was already after one in the afternoon on Monday, September 12 by the time we returned from Bryce Canyon National Park’s southern viewpoints to the Bryce Amphitheater area. 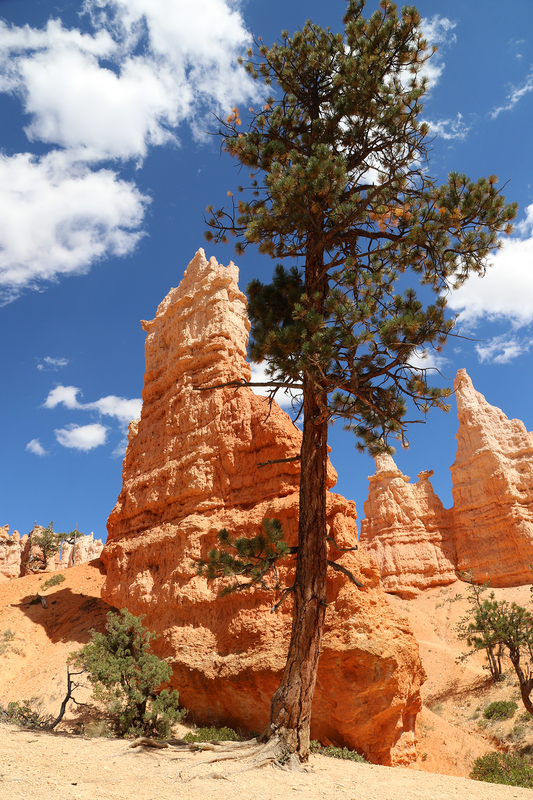 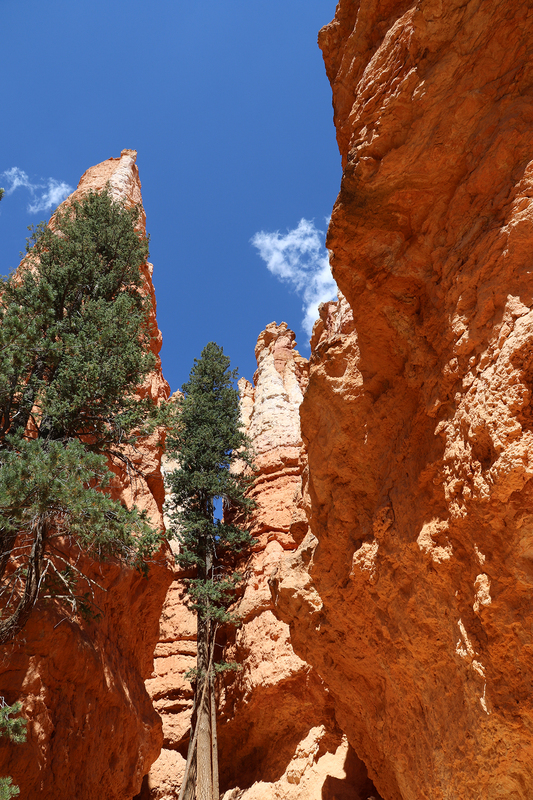 Our plan had been to wrap up our time at Bryce Canyon in the morning before continuing down the Grand Staircase to Zion National Park with a stop at Cedar Breaks National Monument. 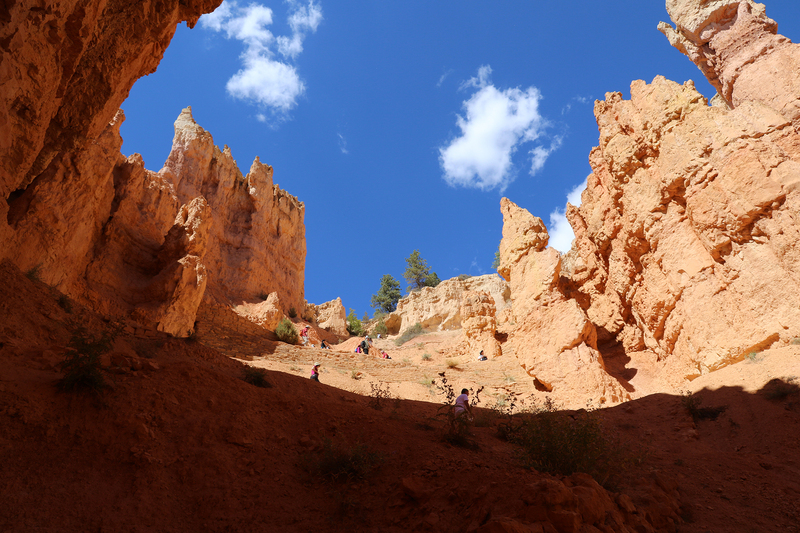 But we just weren’t yet ready to tear ourselves away from Bryce Canyon. 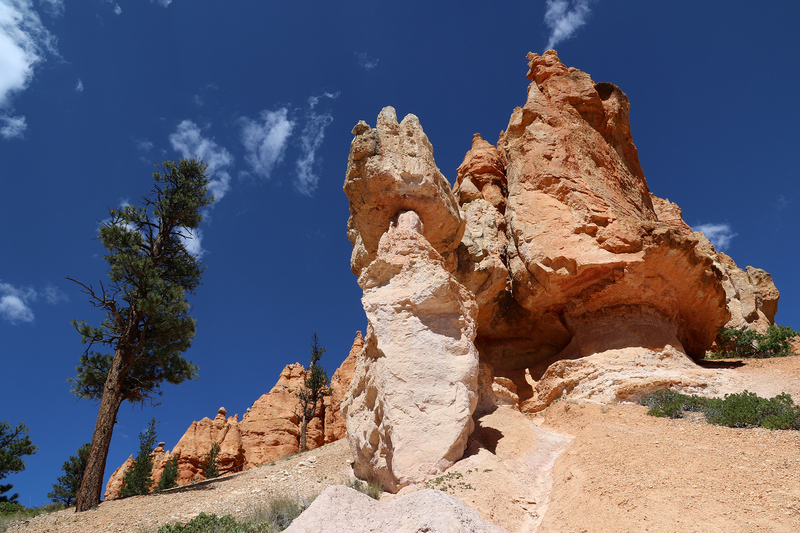 At least not without one last hike beneath the rim and into the Queen’s Garden Complex of hoodoos. 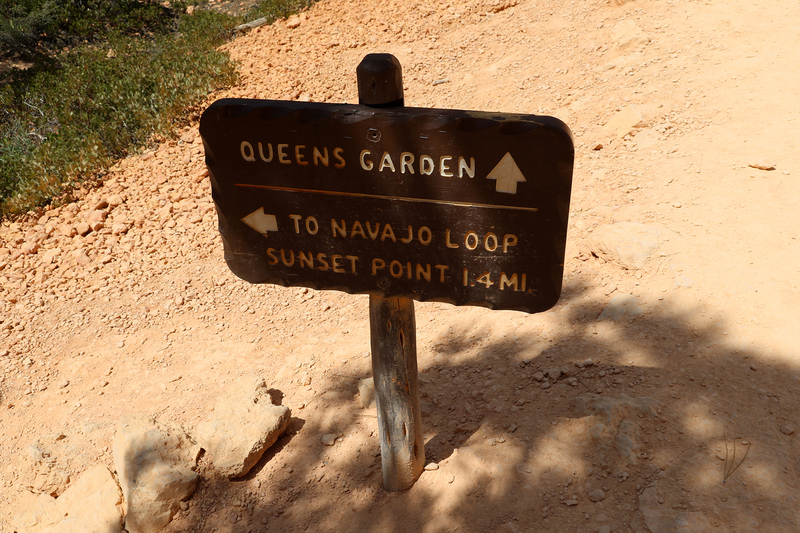 It was a short trail, only 0.8 miles with a vertical drop of about 320 feet. 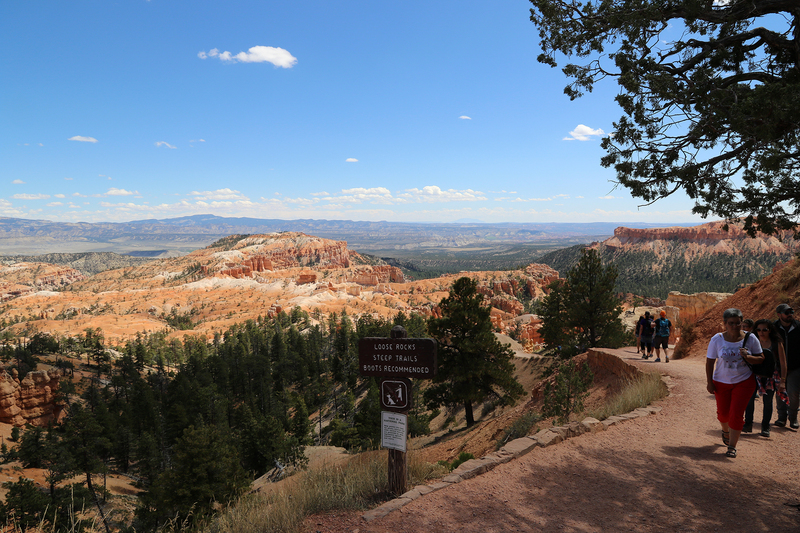 The trailhead was adjacent to Sunrise Point, and we were luckily able to find a parking spot in the large, but crowded parking area. 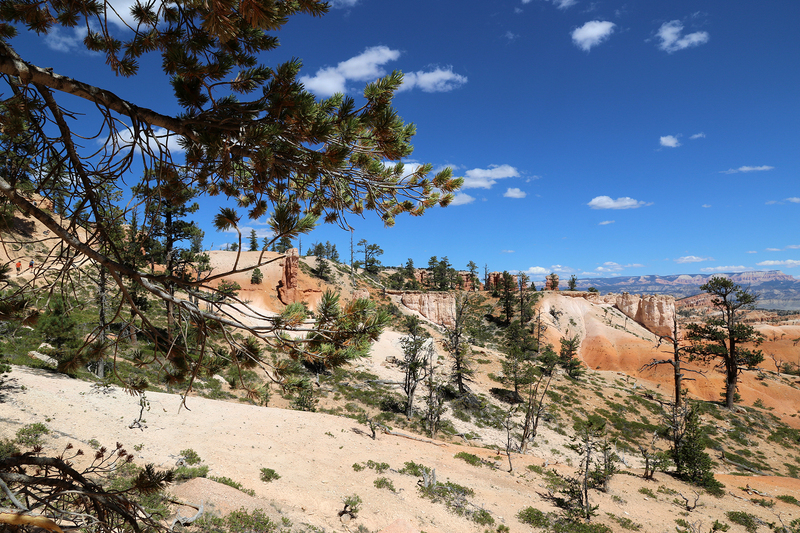 Almost immediately, as the trail wound out in front of and beneath Sunrise Point in a series of meandering switchbacks, stellar views opened up. 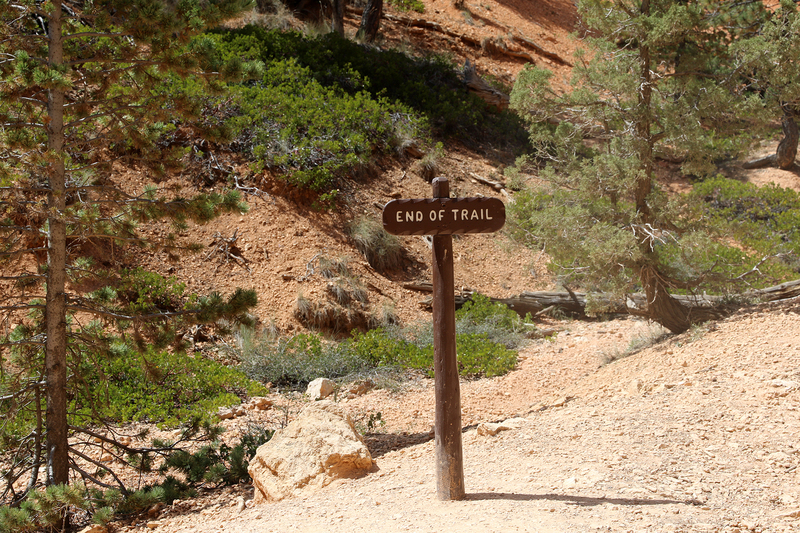 The trail was wide and dusty with dozens of hikers ascending and descending it. 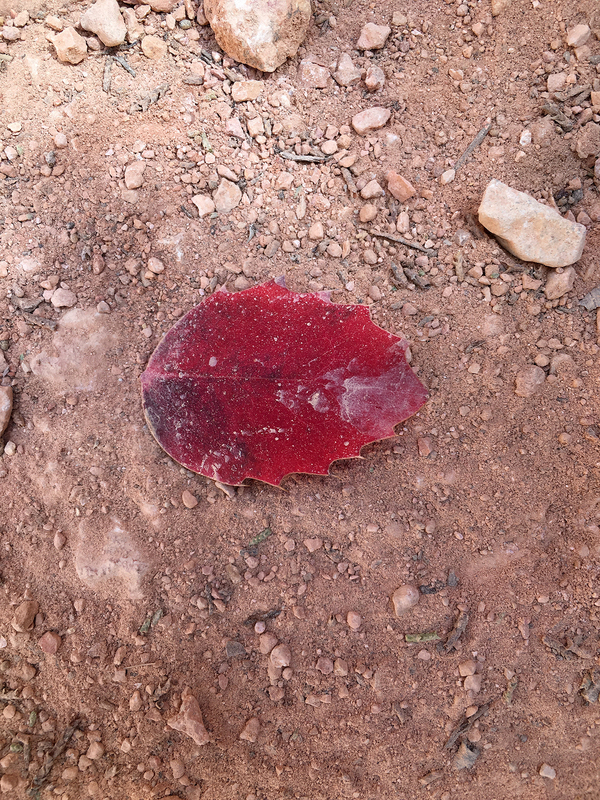 Some were clearly prepared for a moderate hike. 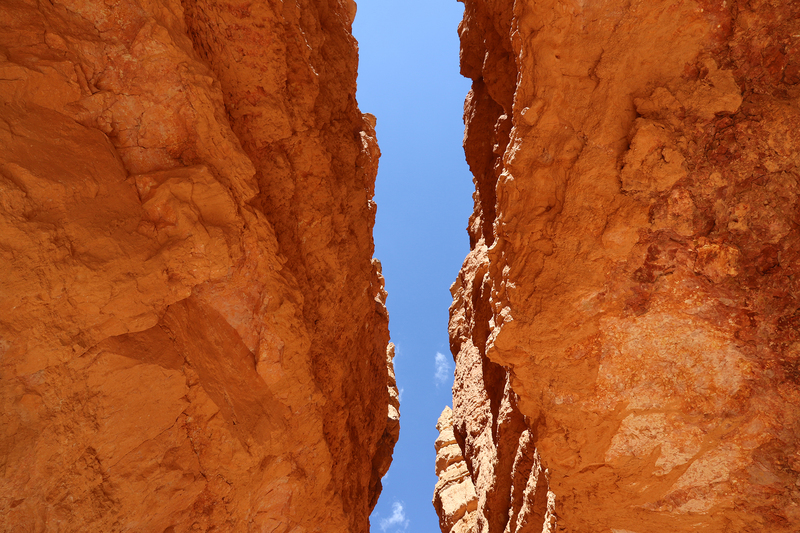 Others clearly weren’t. 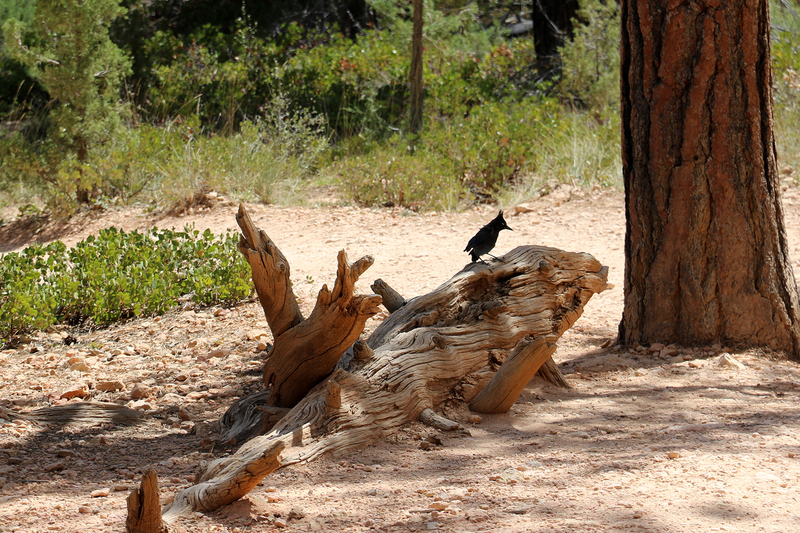 But everyone seemed to be enjoying him or herself. 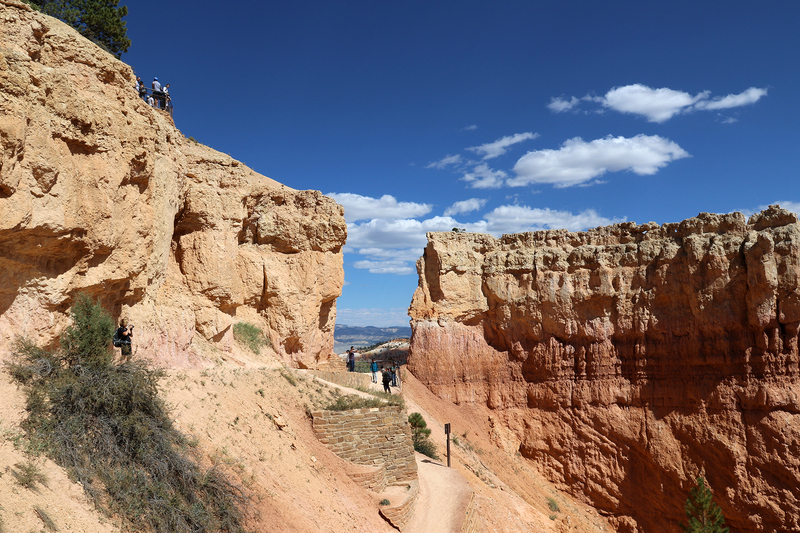 The descent was gentler than Navajo Trail and less hemmed in by hoodoos. 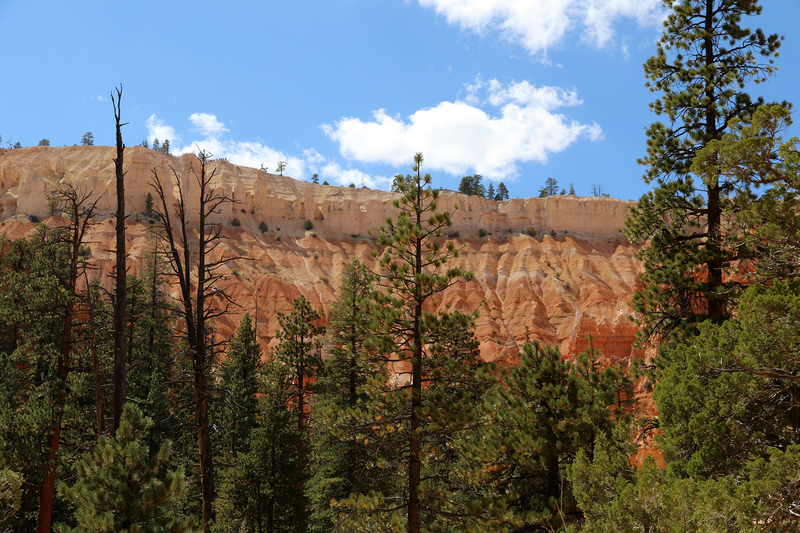 The upper slopes beneath the rim were more forested than it felt they would be while gazing down on them from the rim. 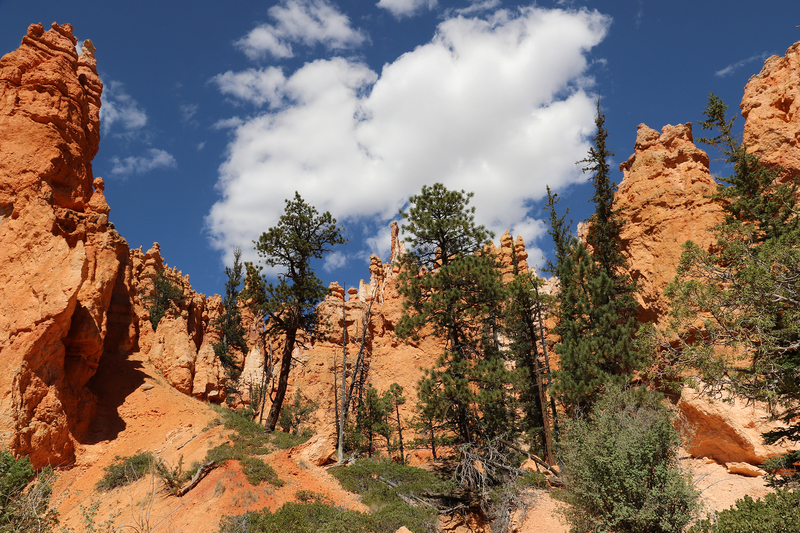 Our surroundings moved from moonscape to dreamscape with the addition of dramatic shifts in light provided by the occasional cloud passing over, sliding shadows over the ridges and cliffs. 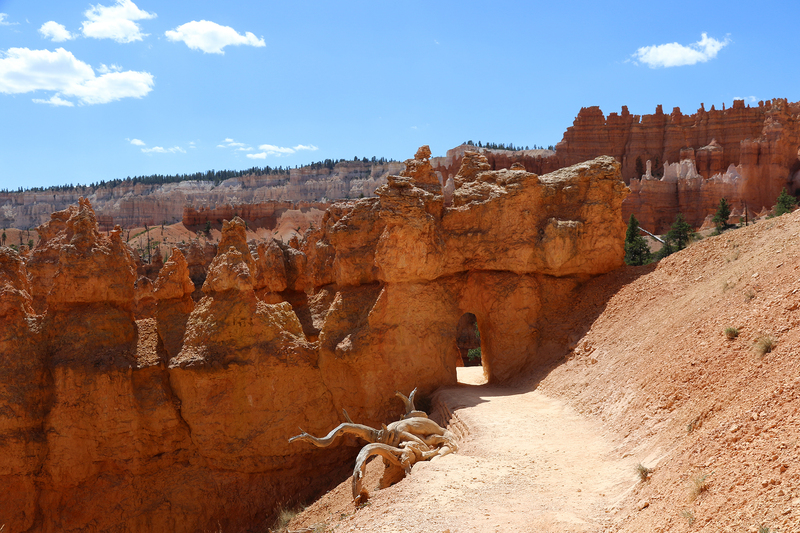 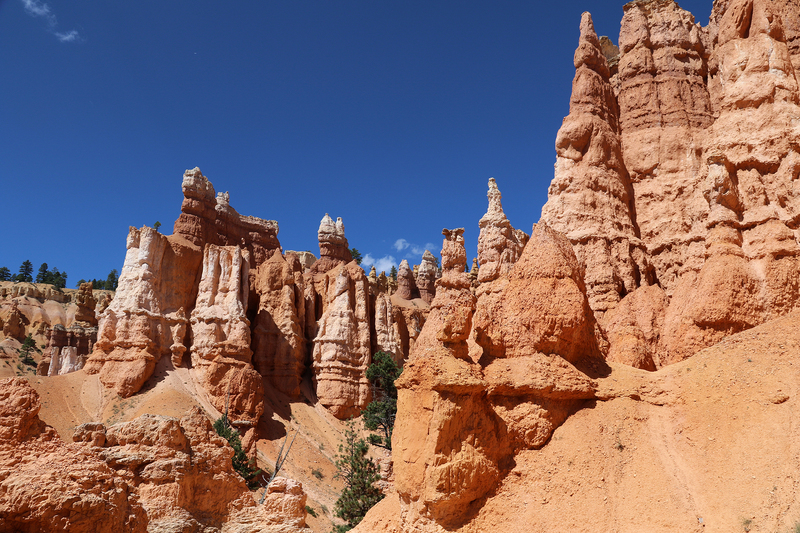 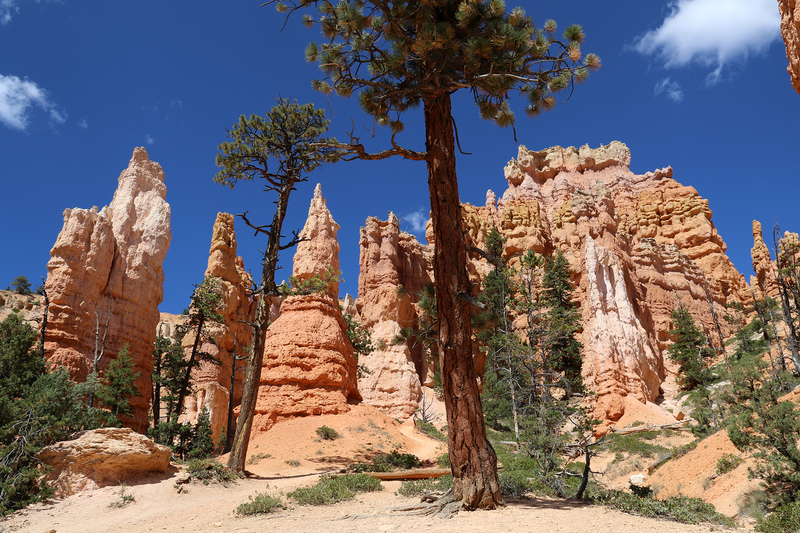 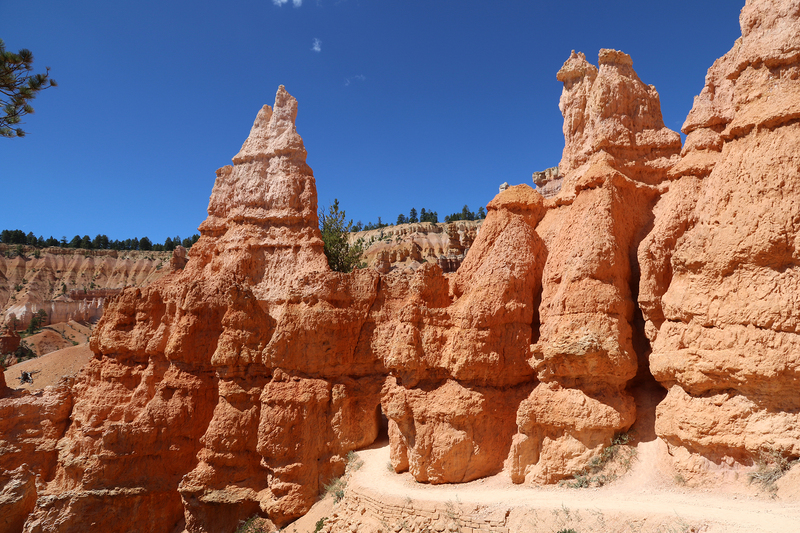 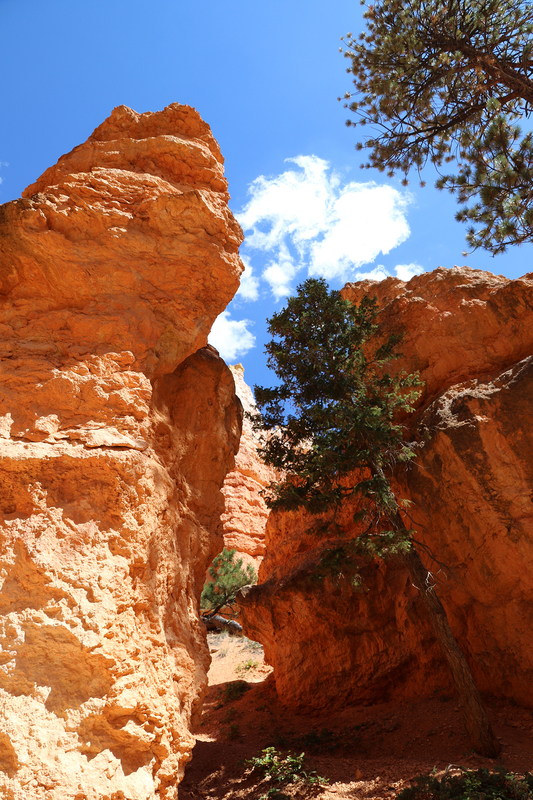 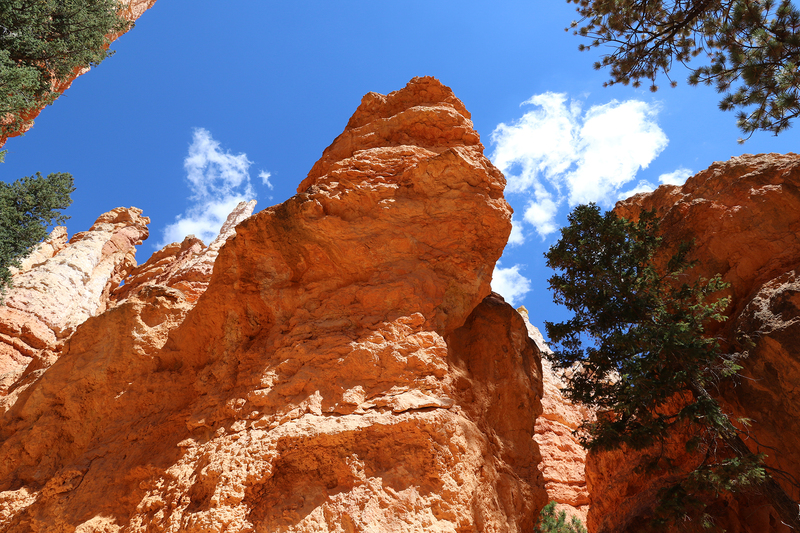 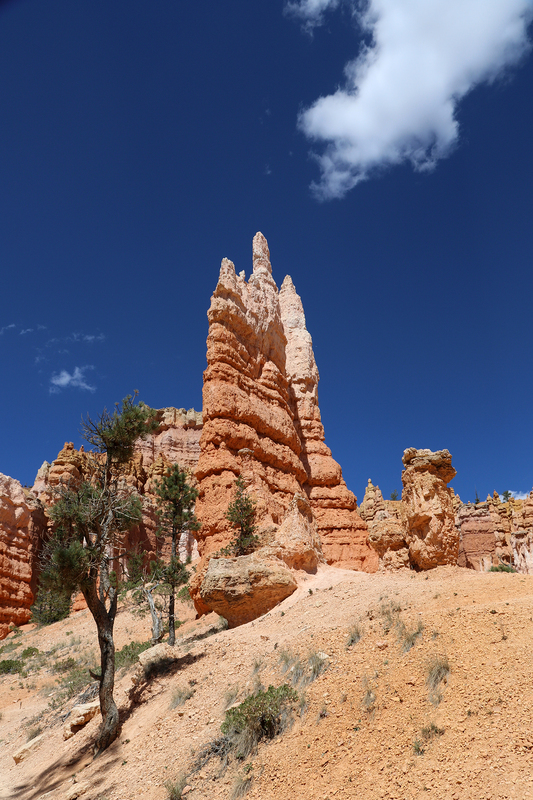 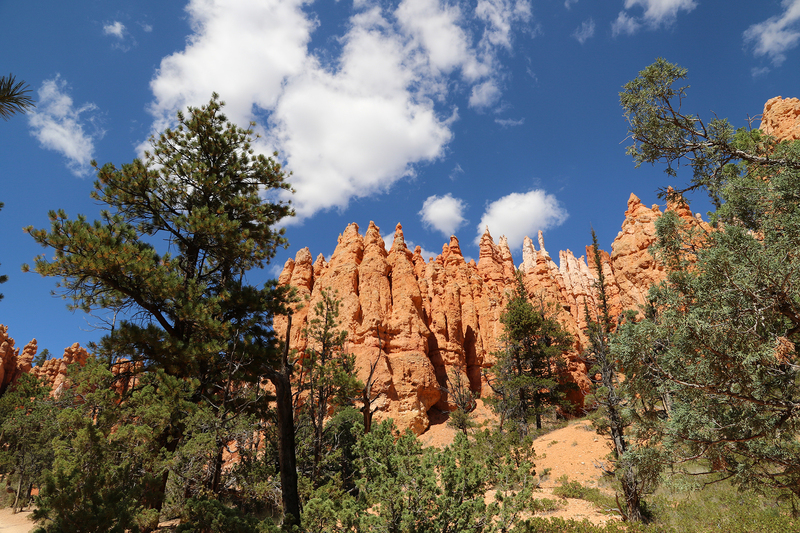 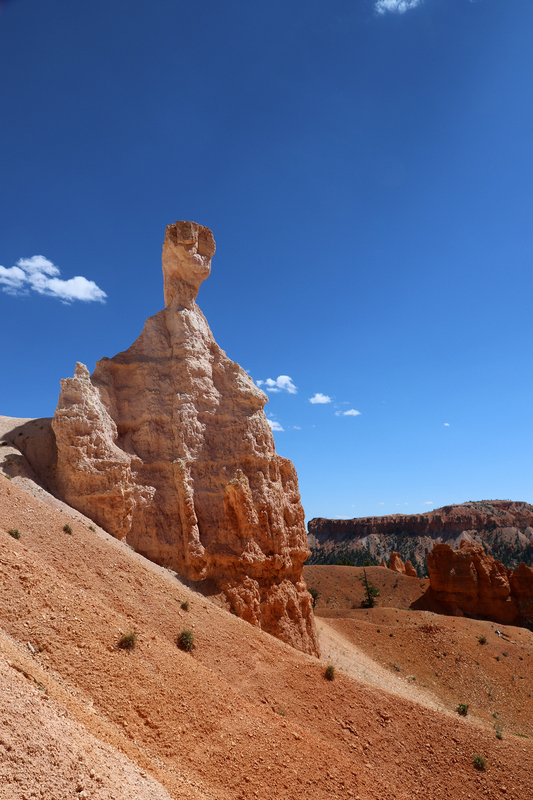 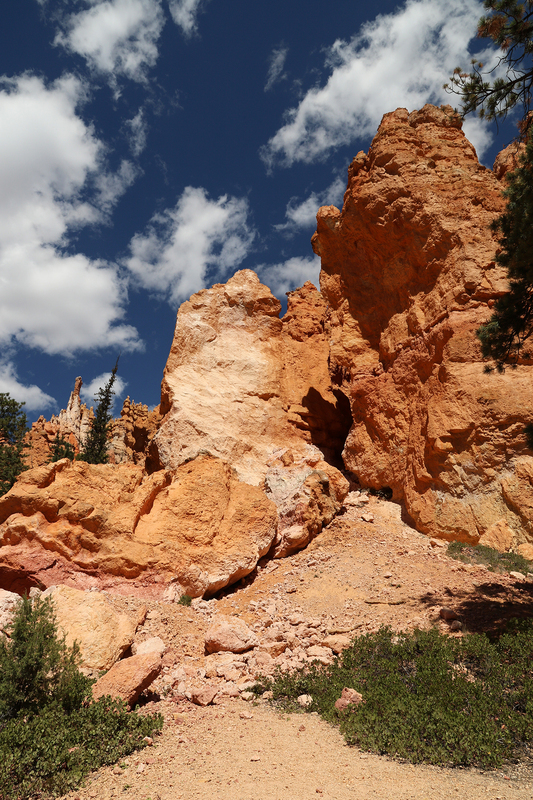 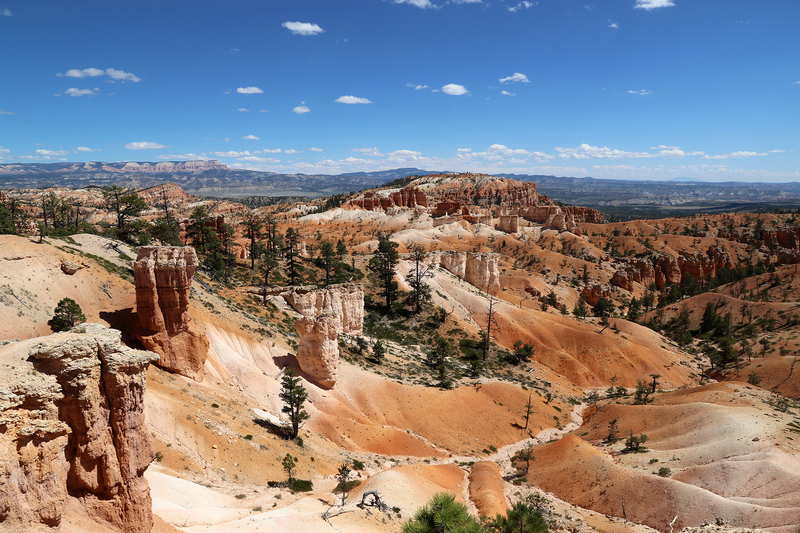 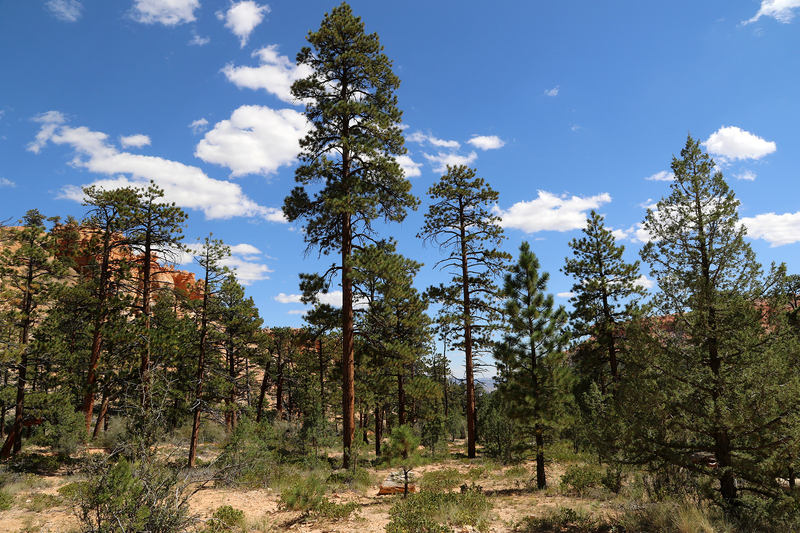 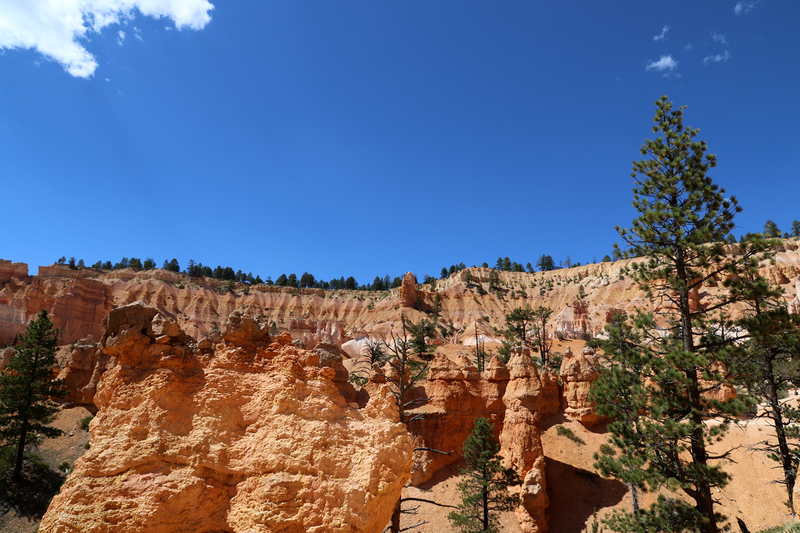 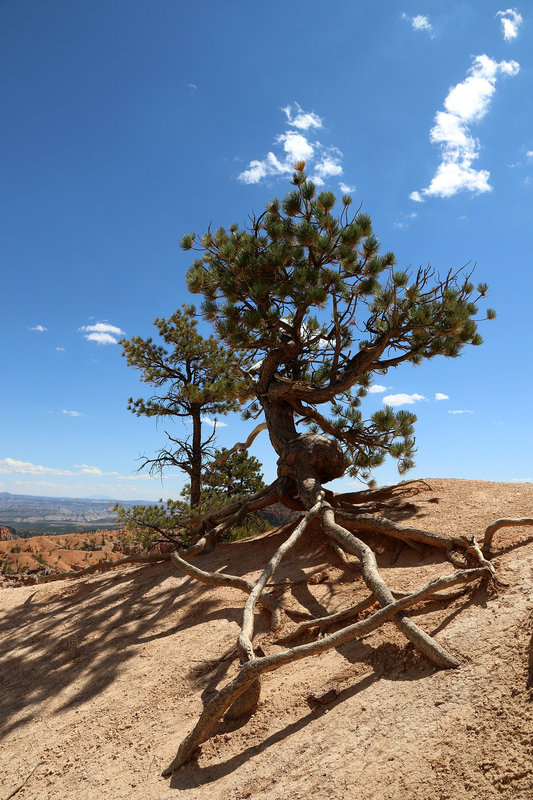 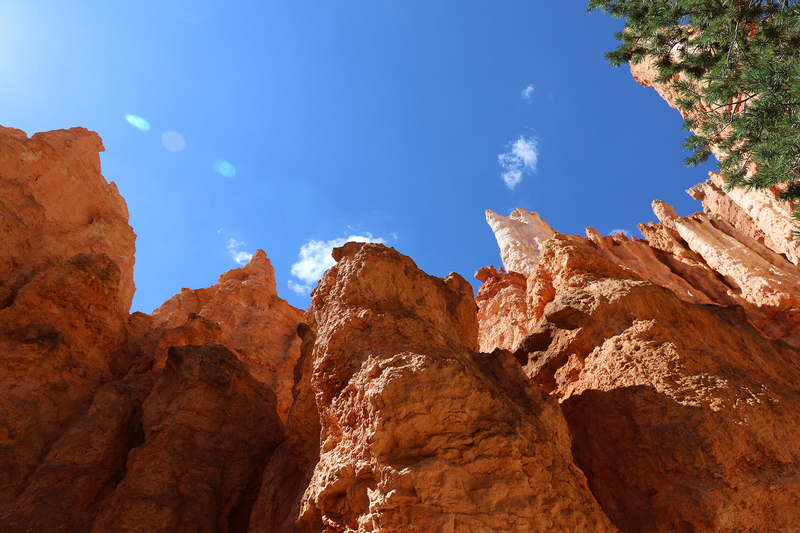 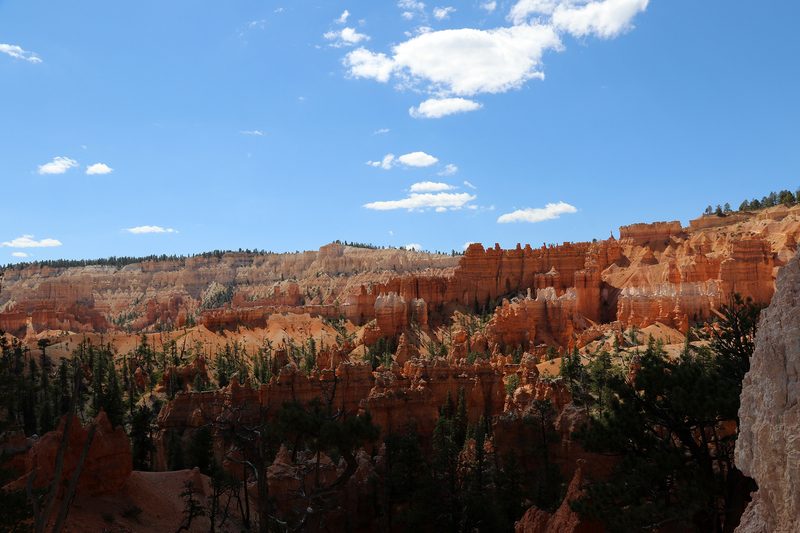 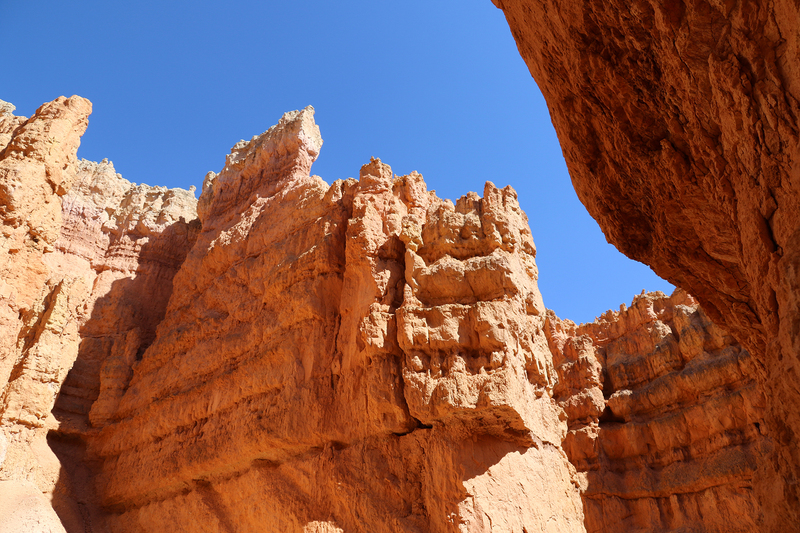 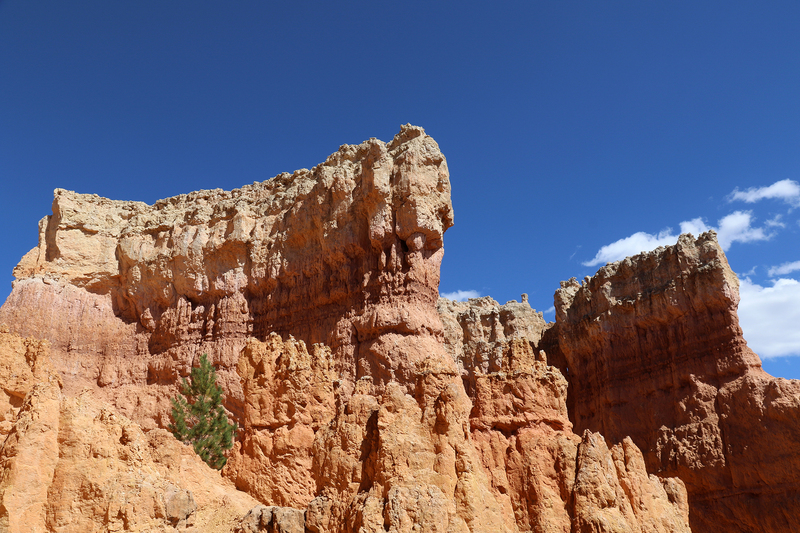 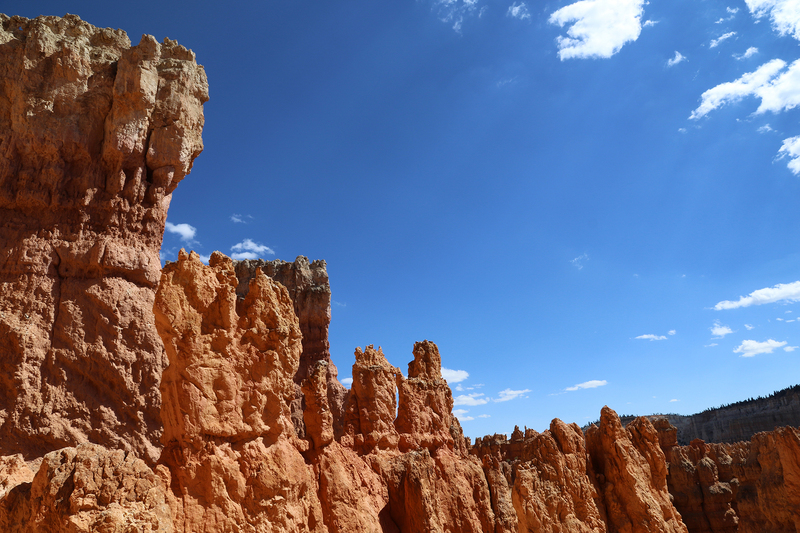 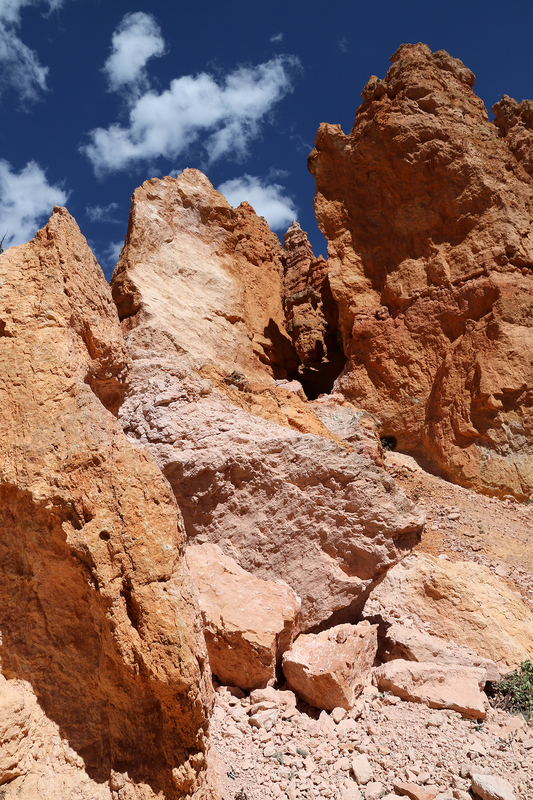 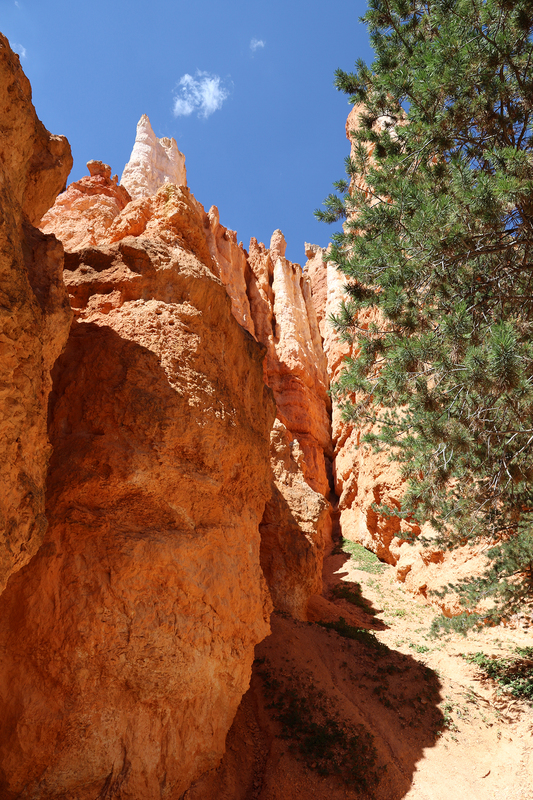 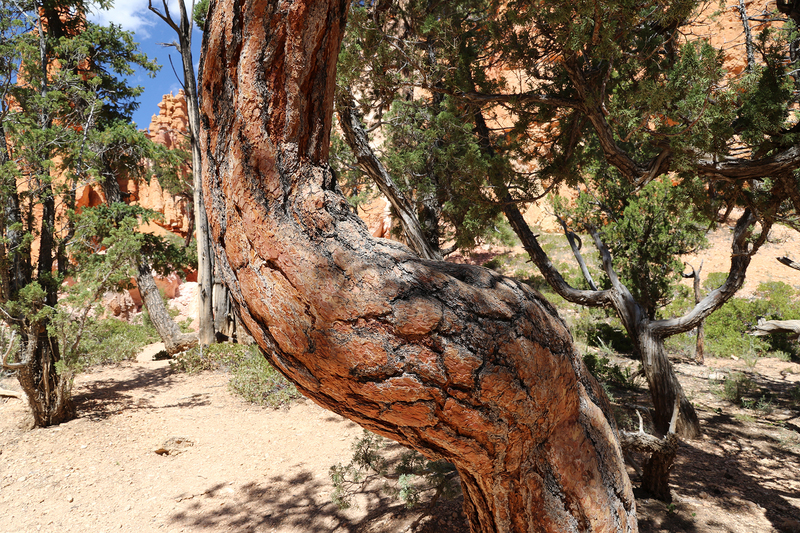 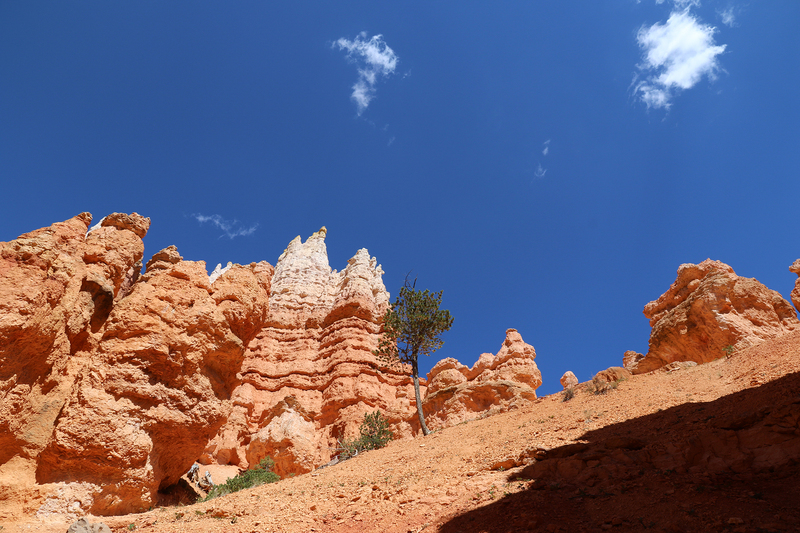 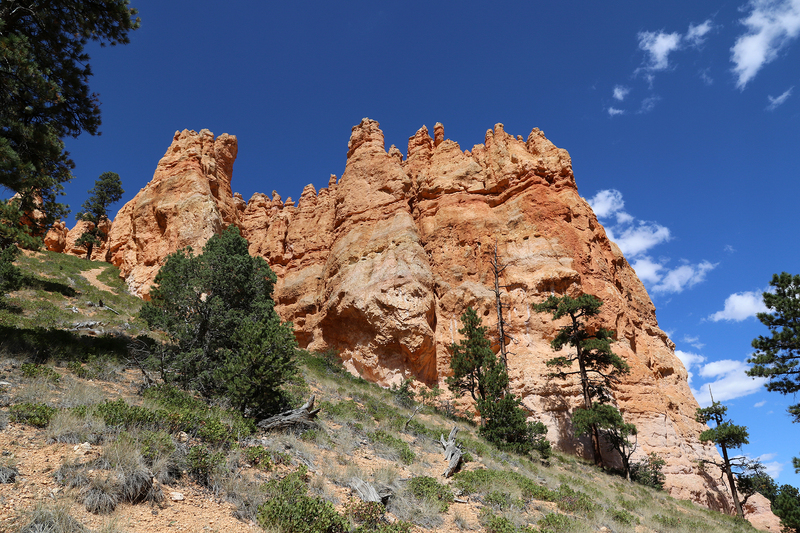 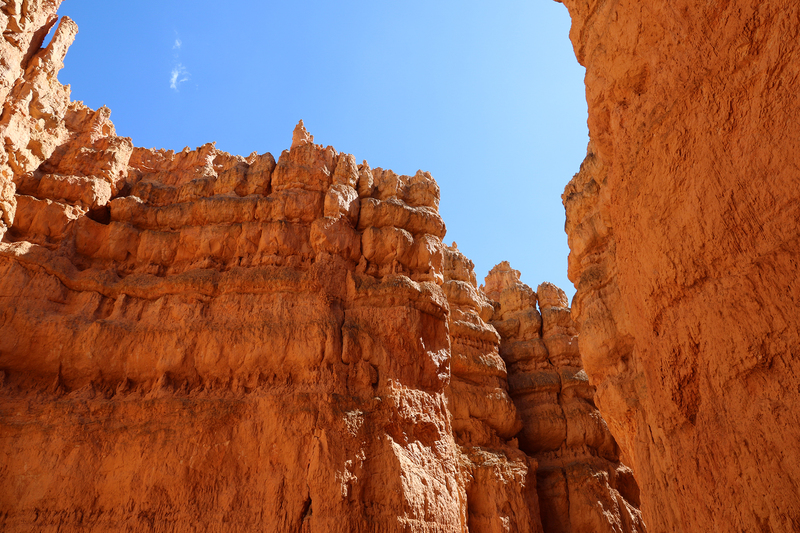 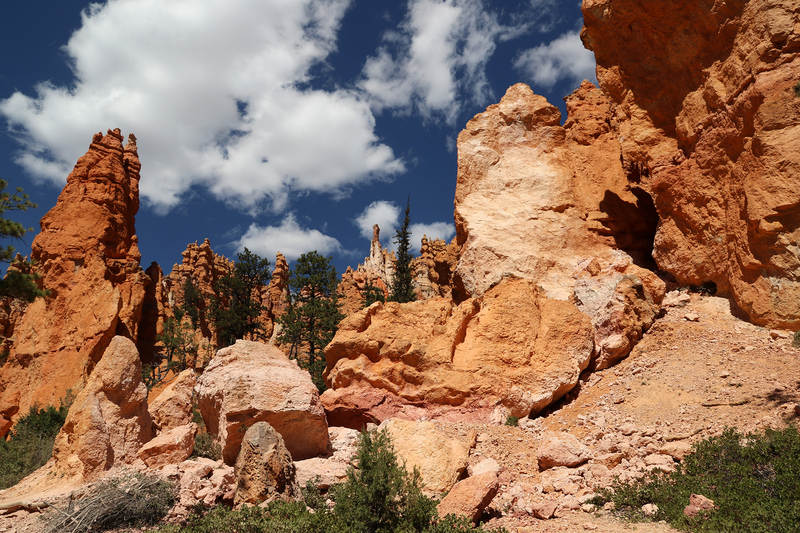 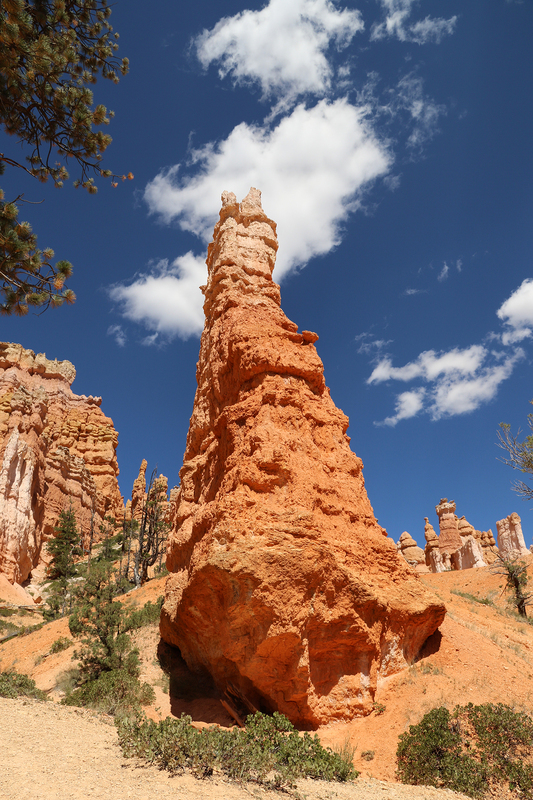 The trail ultimately led decidedly south toward the heart of Bryce Amphitheater. 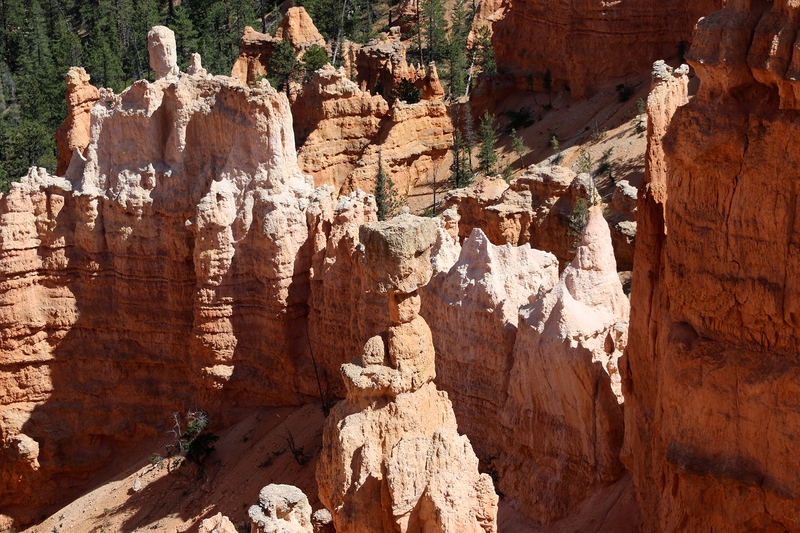 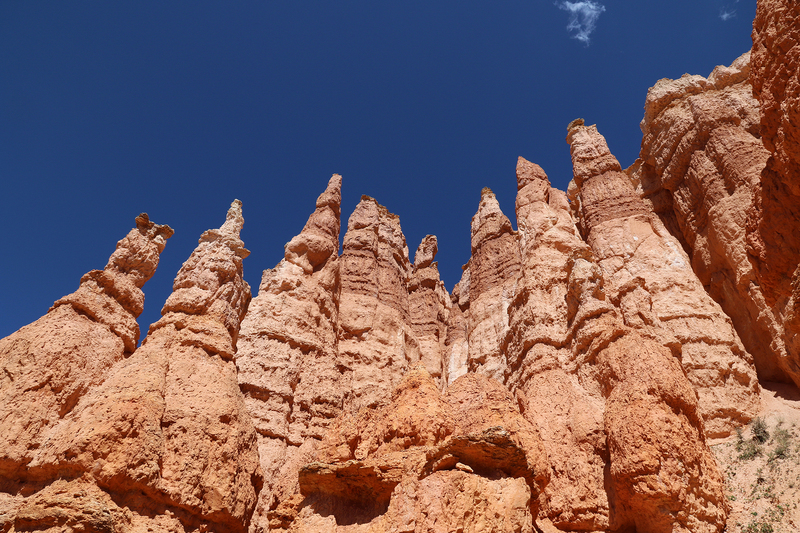 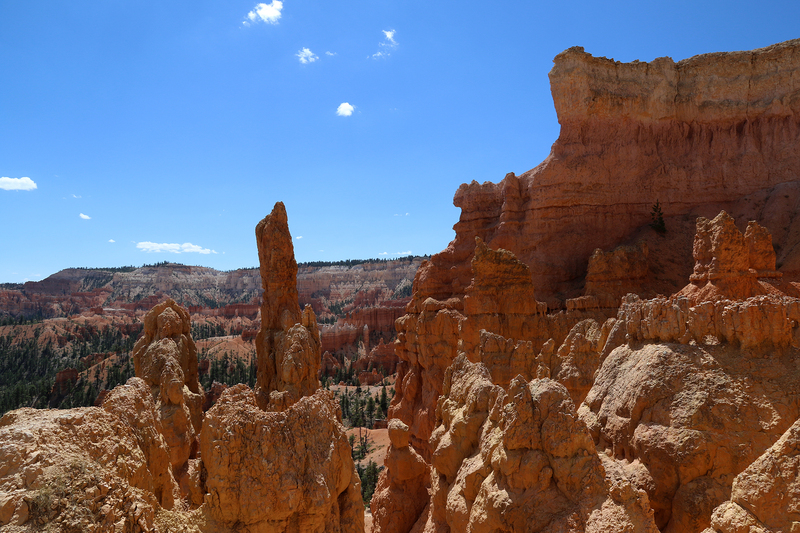 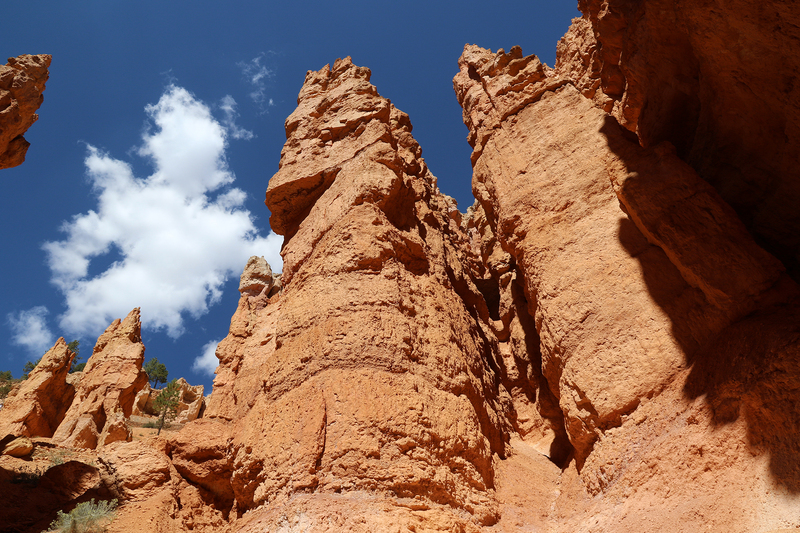 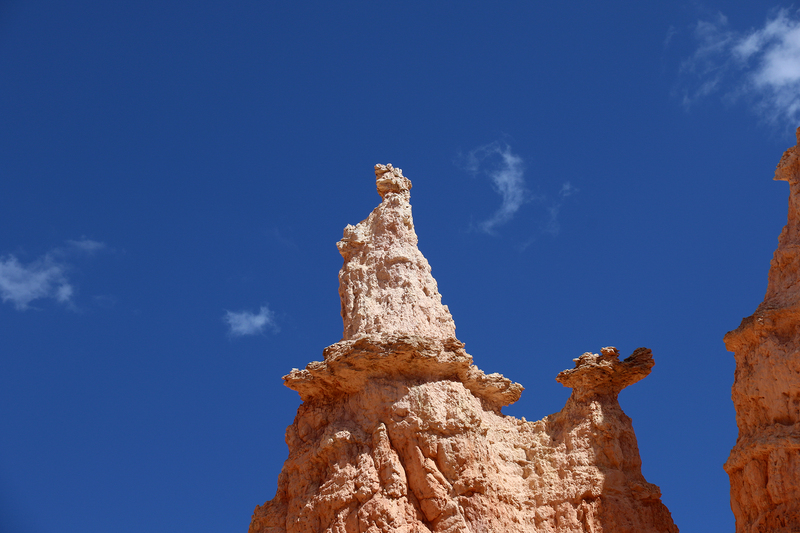 The slopes steepened, and the hoodoos became all the more dramatic. 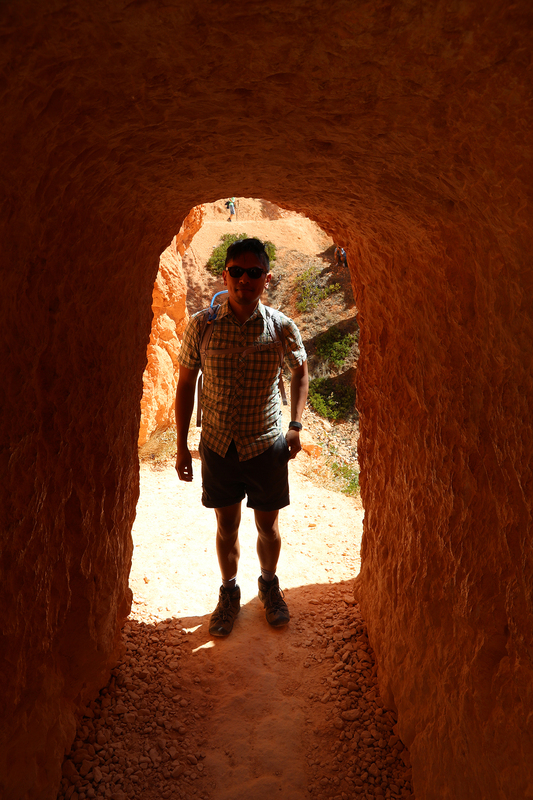 We reached a tunnel and waited for some other hikers to pass through before snapping photos of each other. 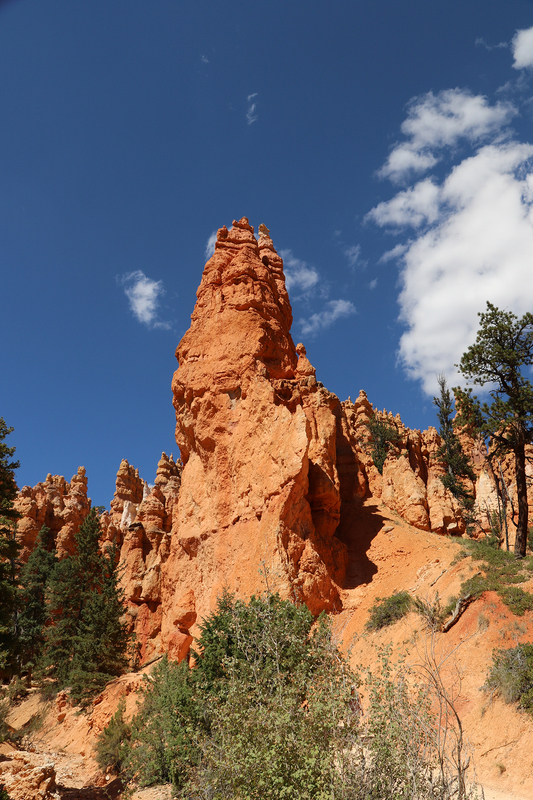 After half an hour, we reached the Queen’s Garden Complex, an array of dramatic hoodoos, one of which featured a formation that struck early visitors as resembling Queen Victoria. 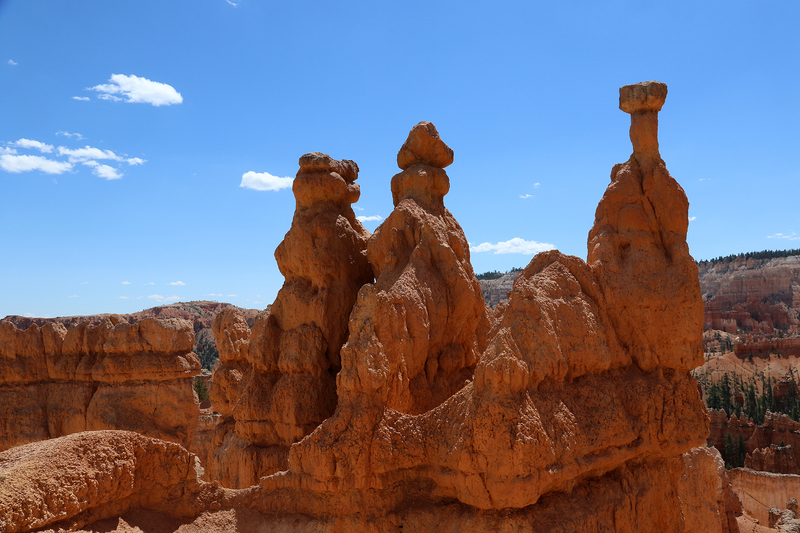 At first we weren’t sure which formation was supposed to be the one looking like the Queen. 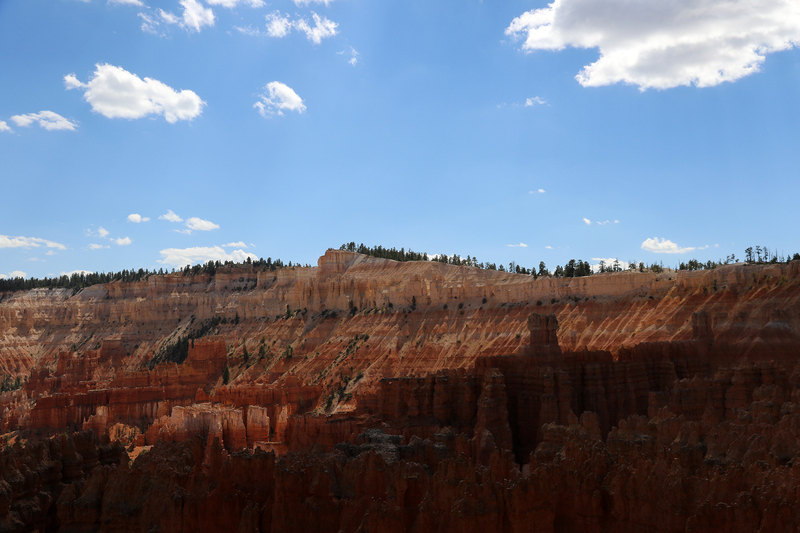 Ah, there she was! 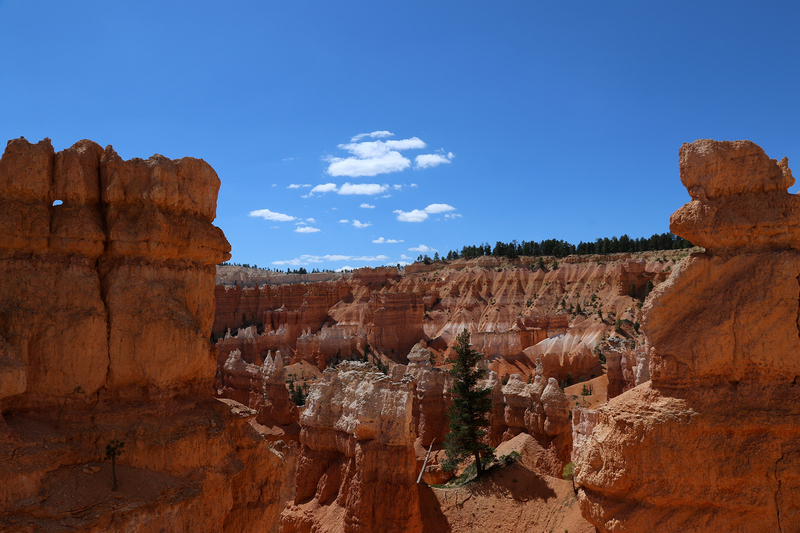 Tower Bridge…Queen Victoria…the early visitors to Bryce Canyon were apparently shameless Anglophiles. 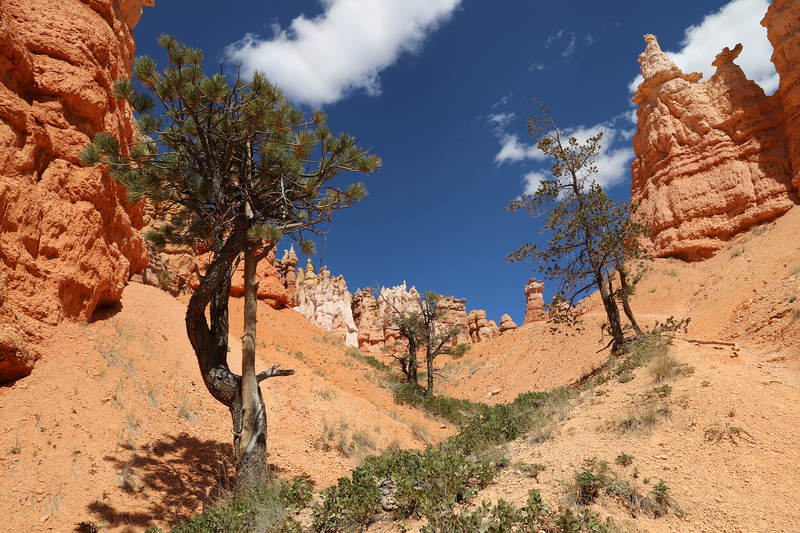 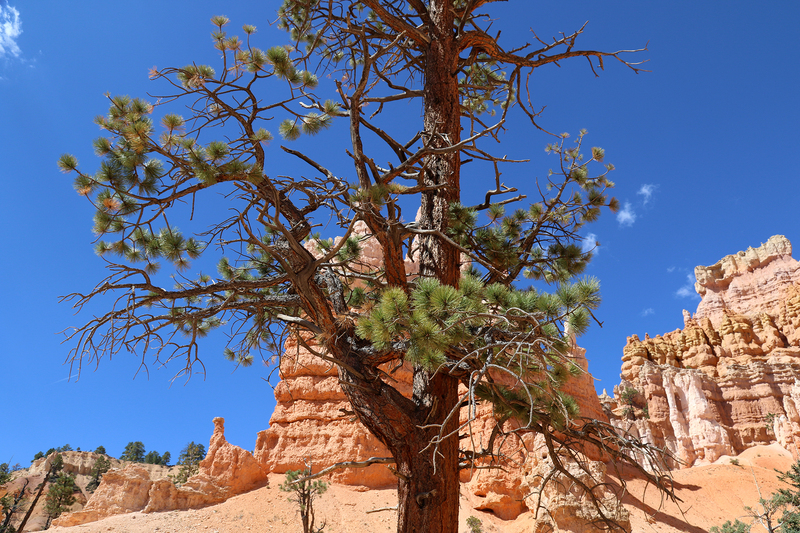 We had a decision to make: return the way we’d just come, back up the Queen’s Garden Trail to Sunrise Point for a 1.6-mile round trip, or continue through the bottom of Bryce Canyon and up Navajo Trail for a 2.2-mile hike. 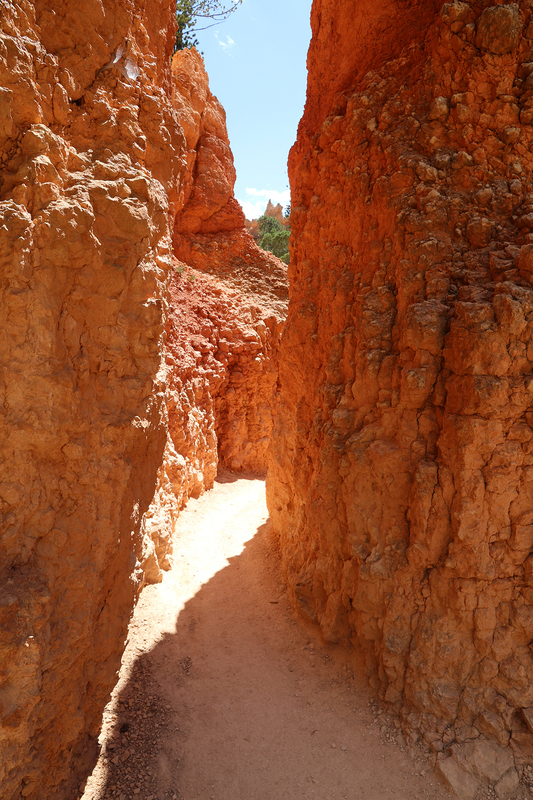 Although we’d already gone down and up Navajo Trail, we opted for the longer option because we’d see the bottom of the canyon, which we’d not yet hiked through. 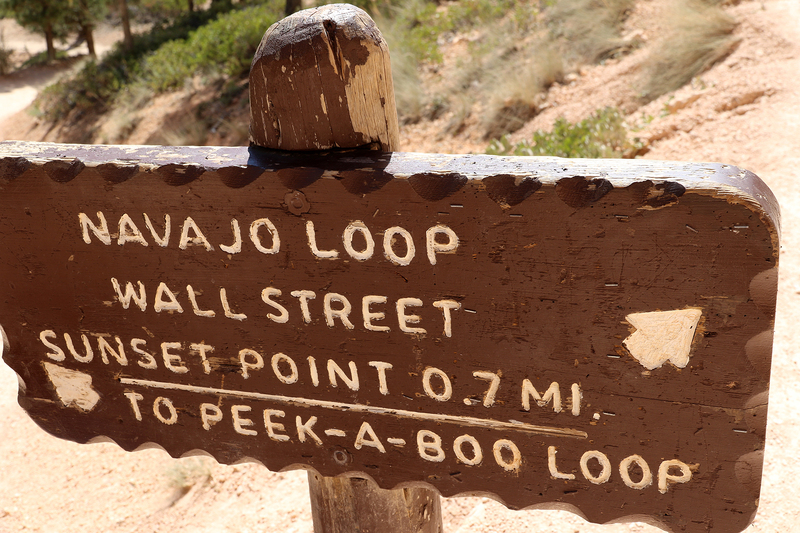 Ideally, we’d have been able to hike up Wall Street and not Navajo, but Wall Street was closed because of the rockslide. 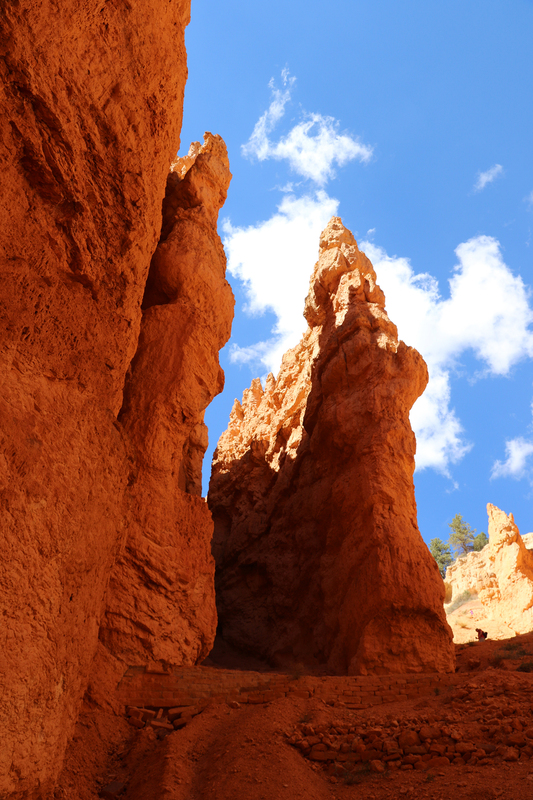 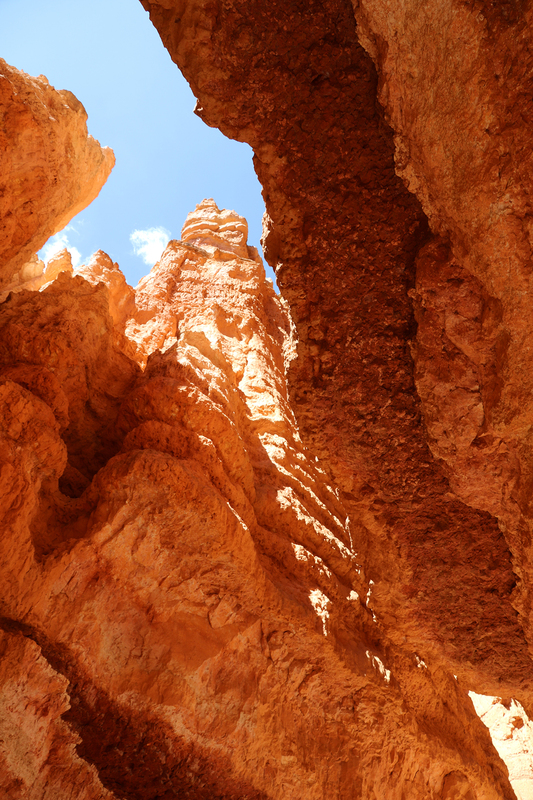 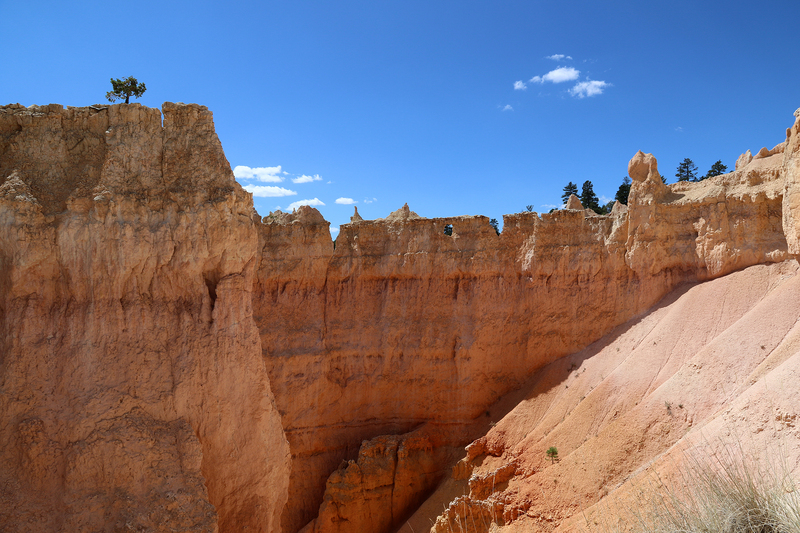 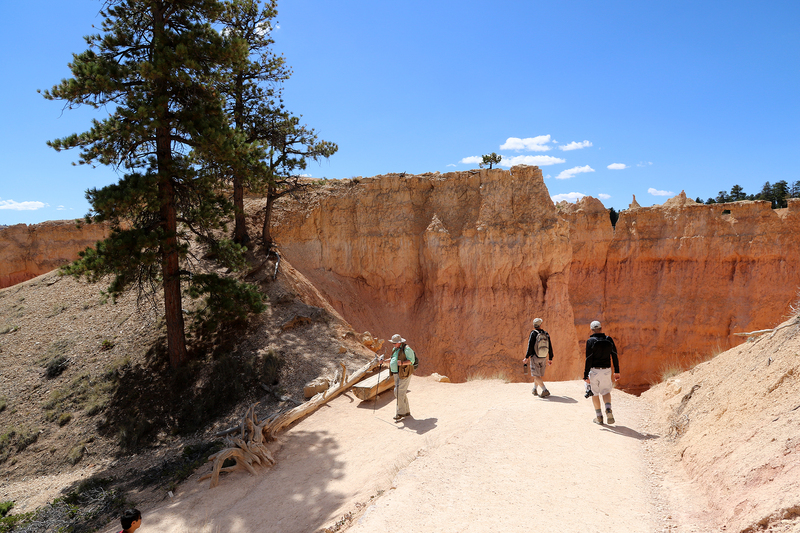 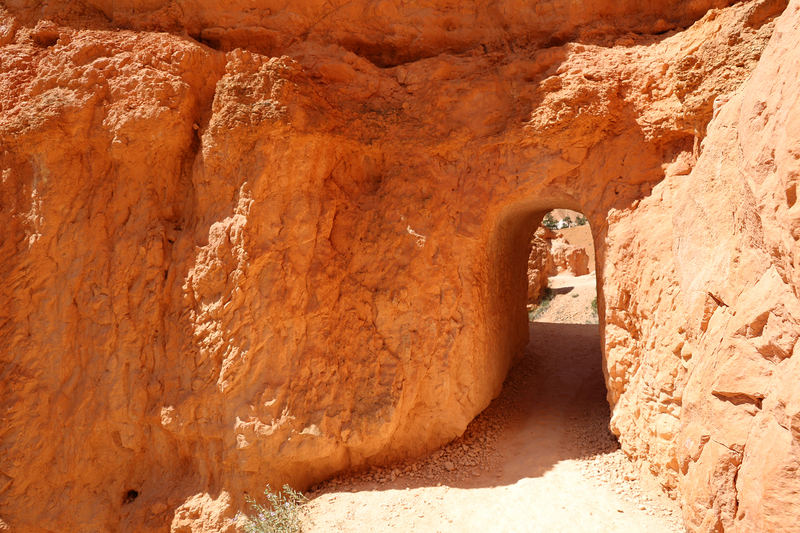 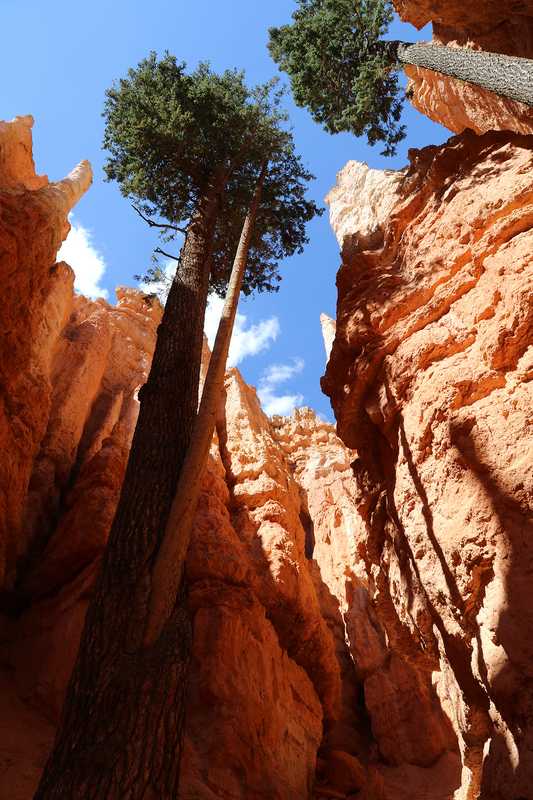 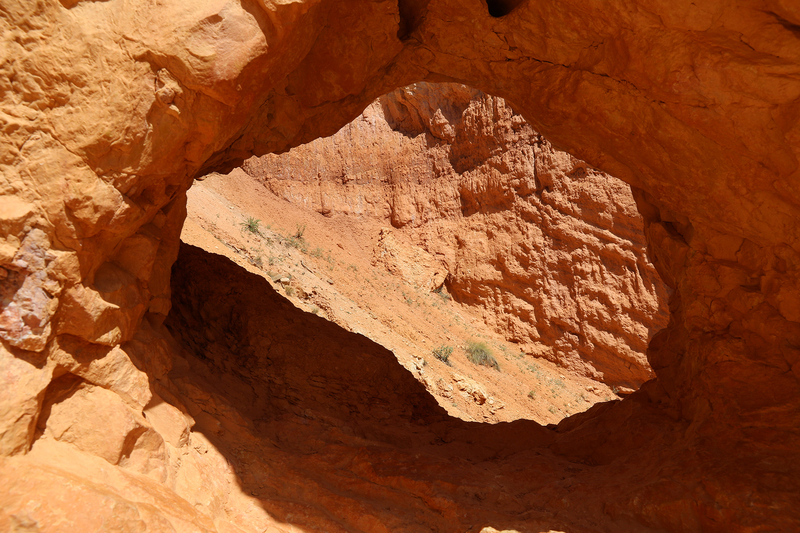 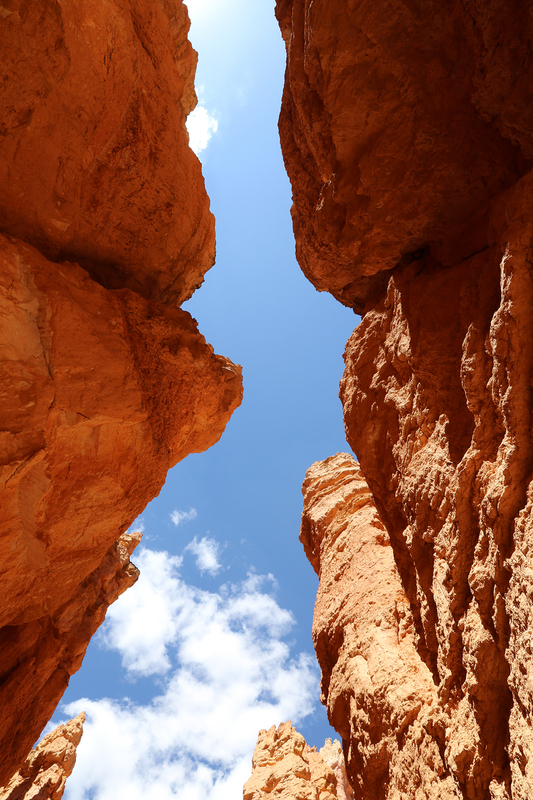 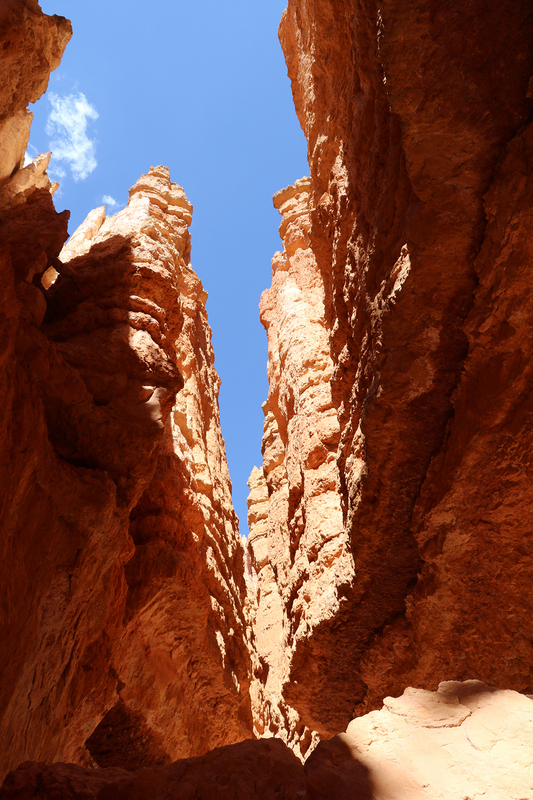 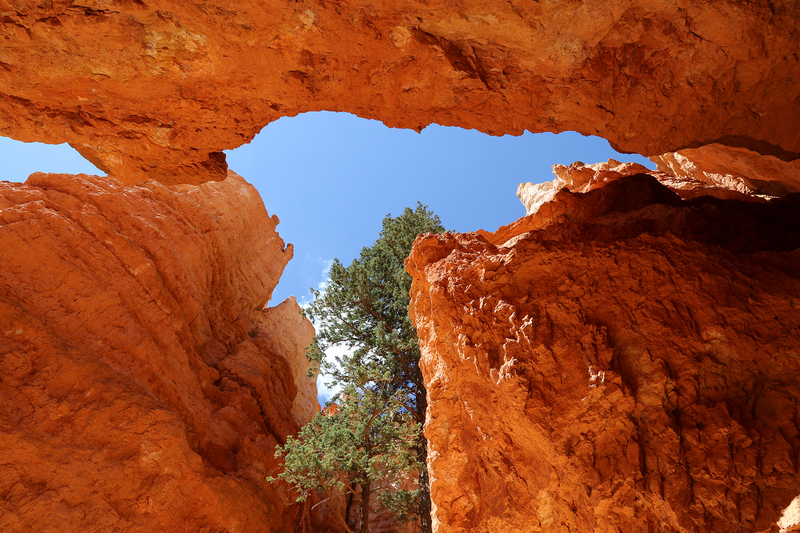 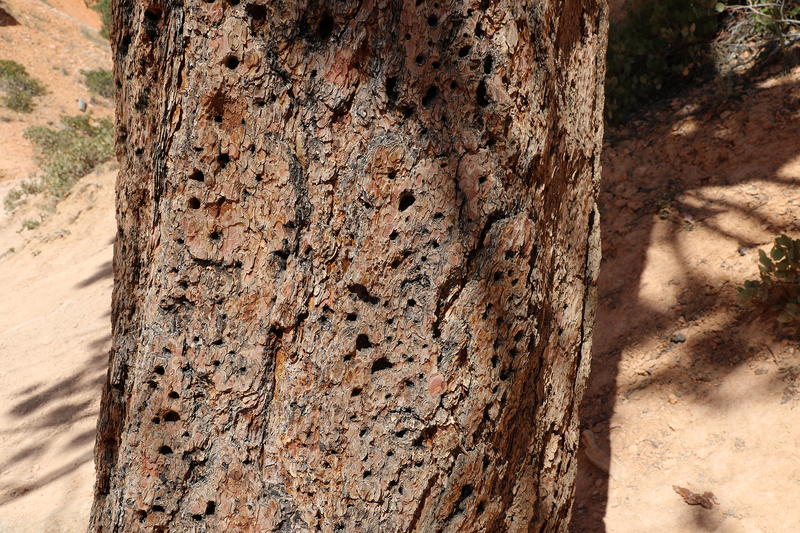 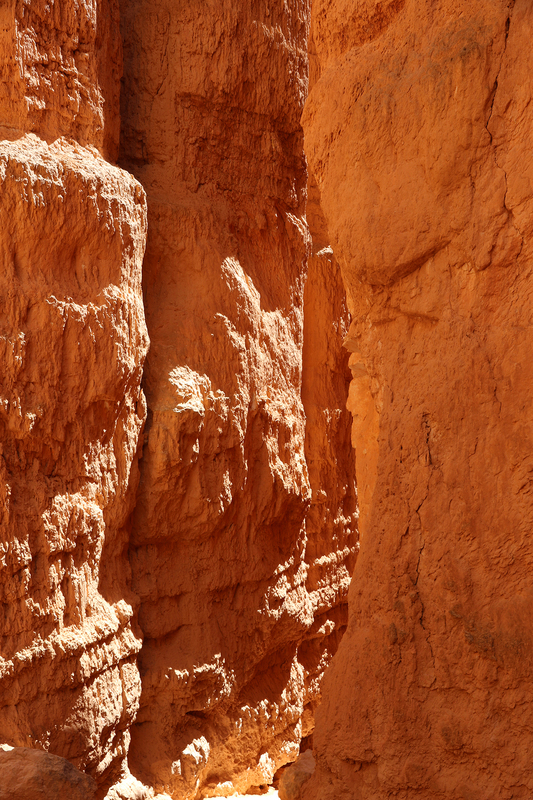 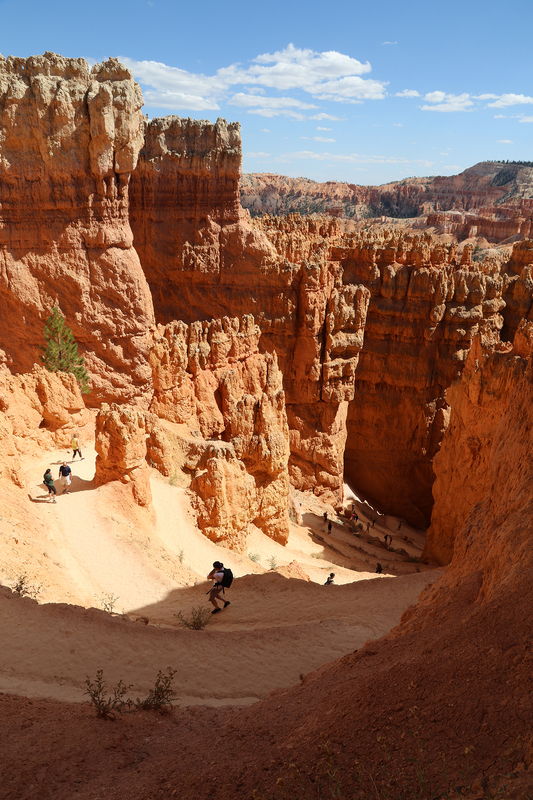 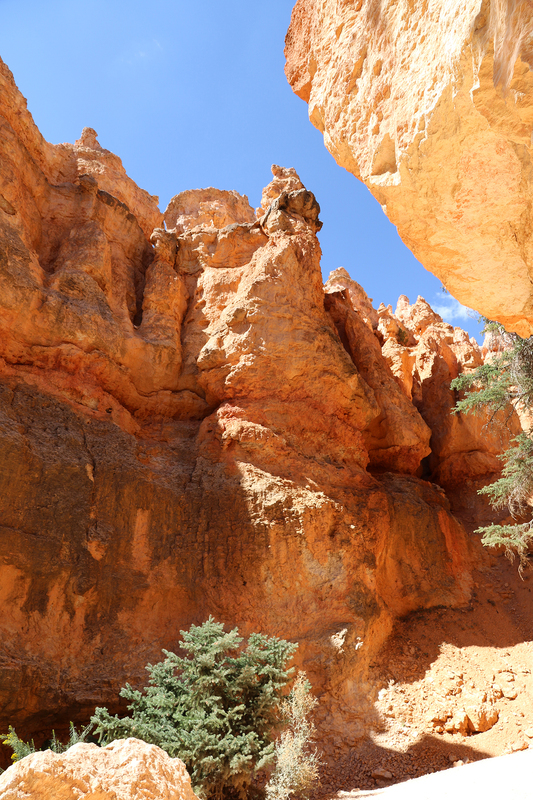 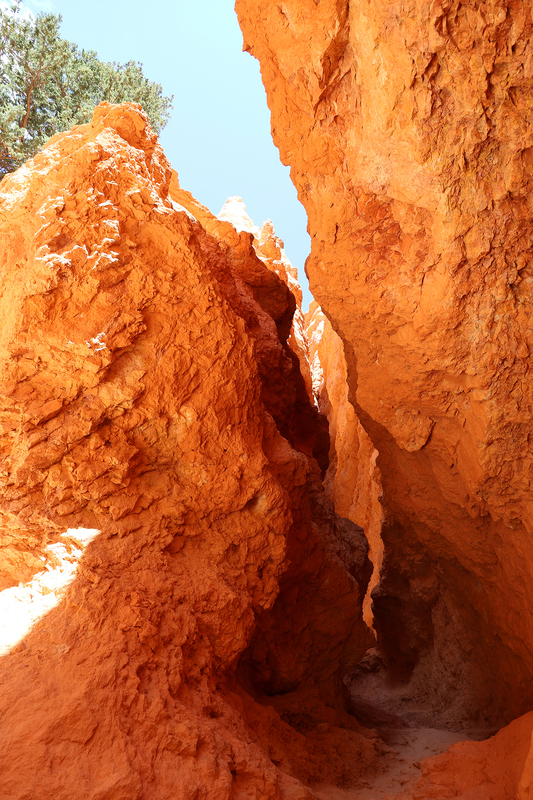 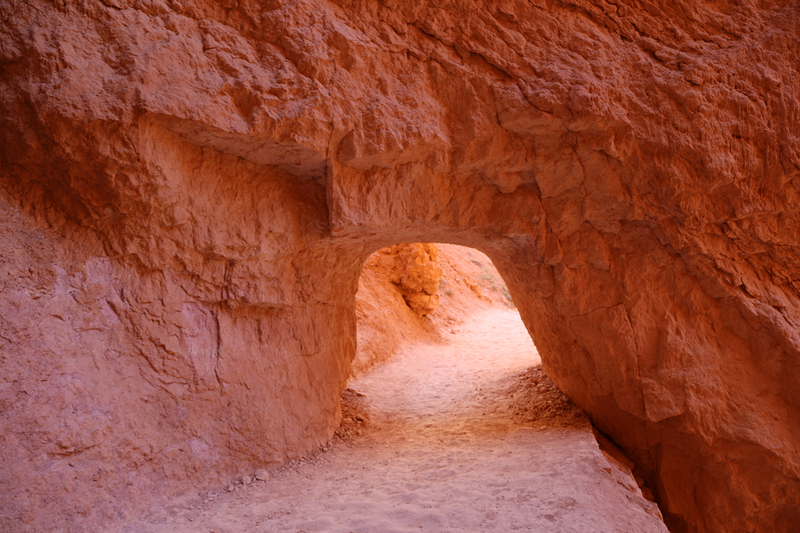 The path along the bottom of Bryce Canyon was level and ultimately opened up as the ground sloped gently east. 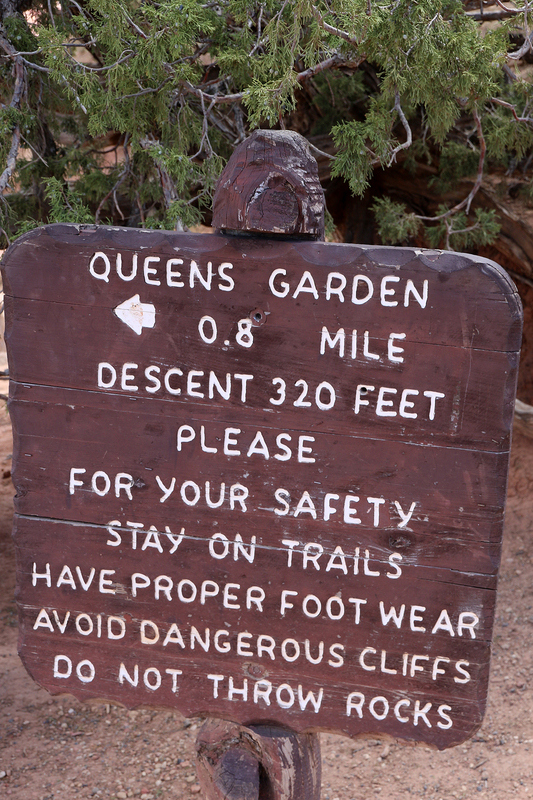 There were fewer hikers down here than there had been on the trail down to Queen’s Garden. 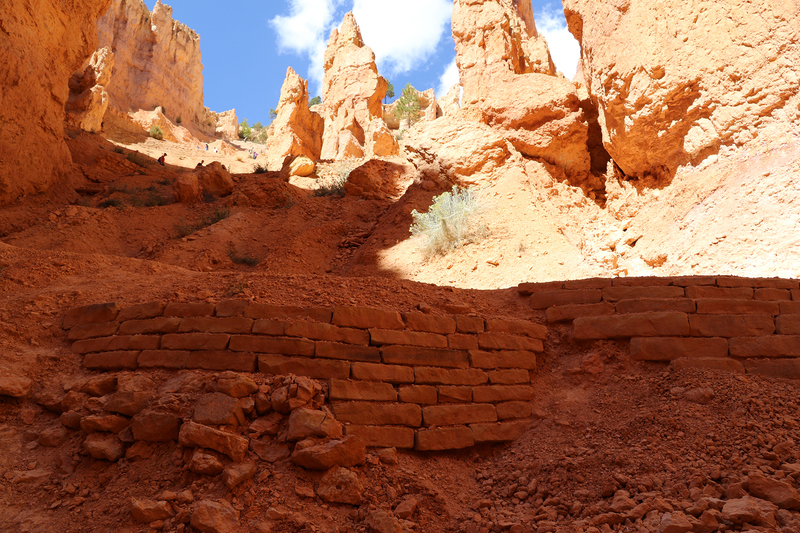 Shortly we reached the junction with Navajo Loop Trail, which we’d hiked to the bottom of the previous day. 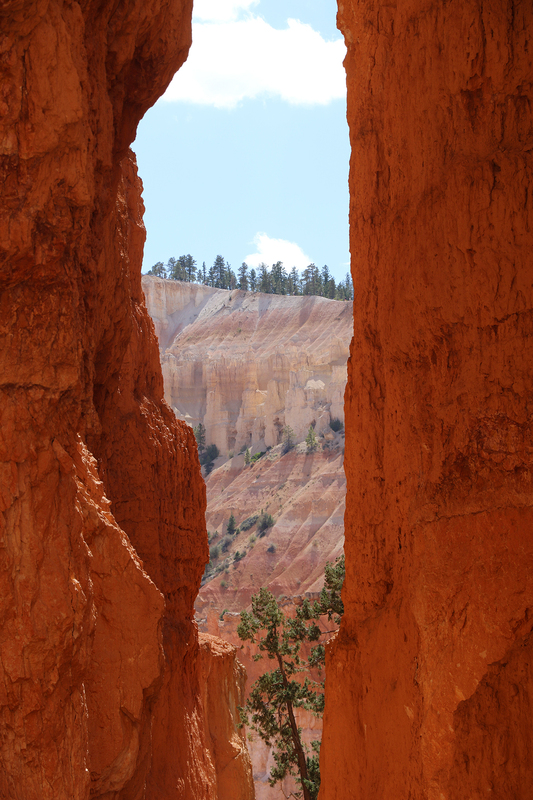 To our huge surprise and delight, the Park Service had reopened the Wall Street section of the trail after determining that there was little imminent danger of further rockslides. 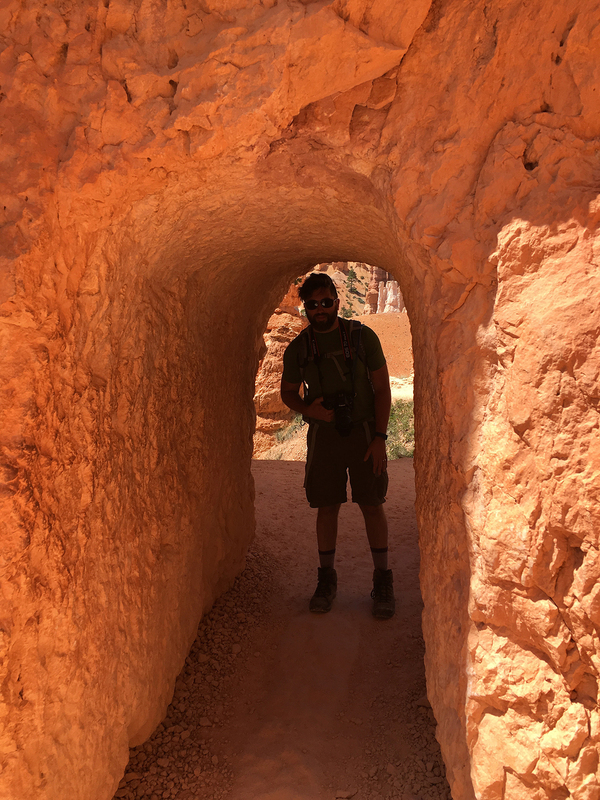 So instead of going up Navajo, we were able to hike back to the rim on the famous Wall Street Trail through the Silent City. 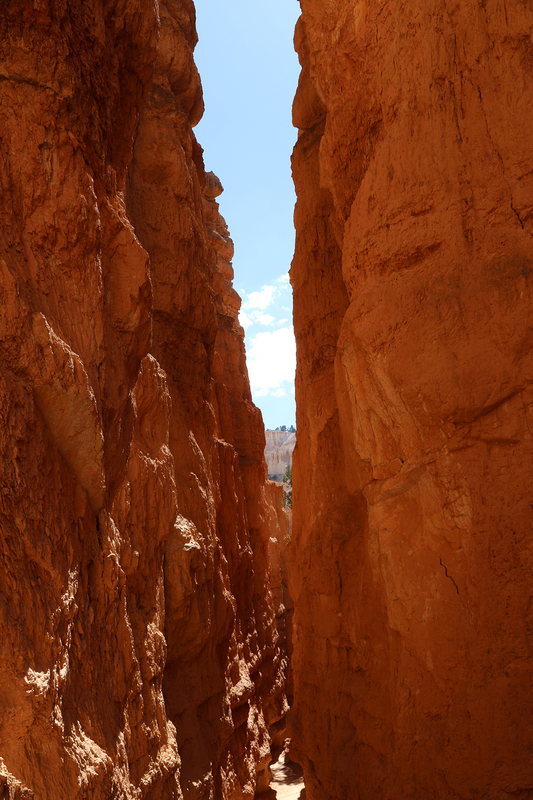 As we approached the bottom of Wall Street proper, we encountered the rockslide, huge on the righthand (northeast) side of the trail. 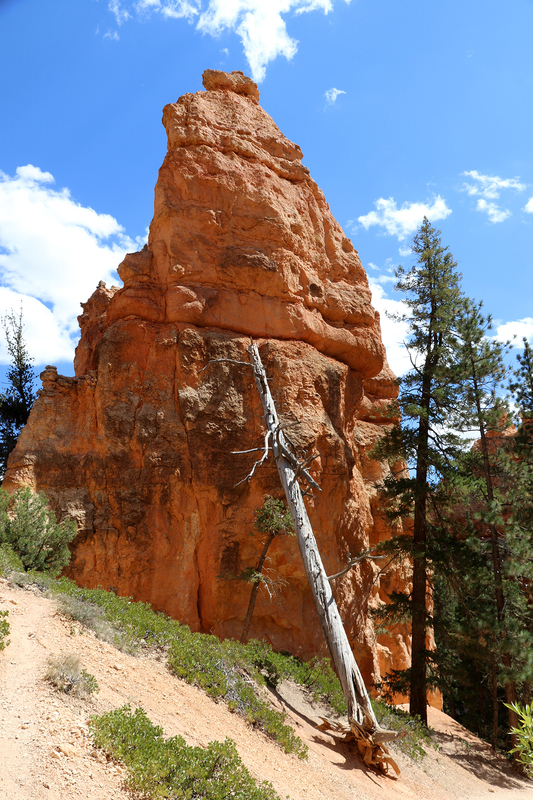 Most of the debris had been cleared from the trail except for one moderate rock freshly deposited. 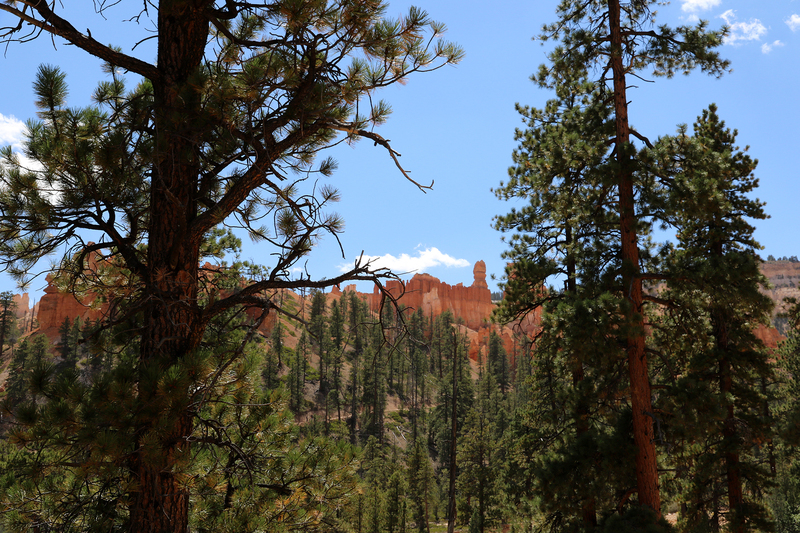 We paused to take it in and chatted with some other hikers who had not heard about the closure and didn’t realize the rockslide was barely forty-eight hours old. 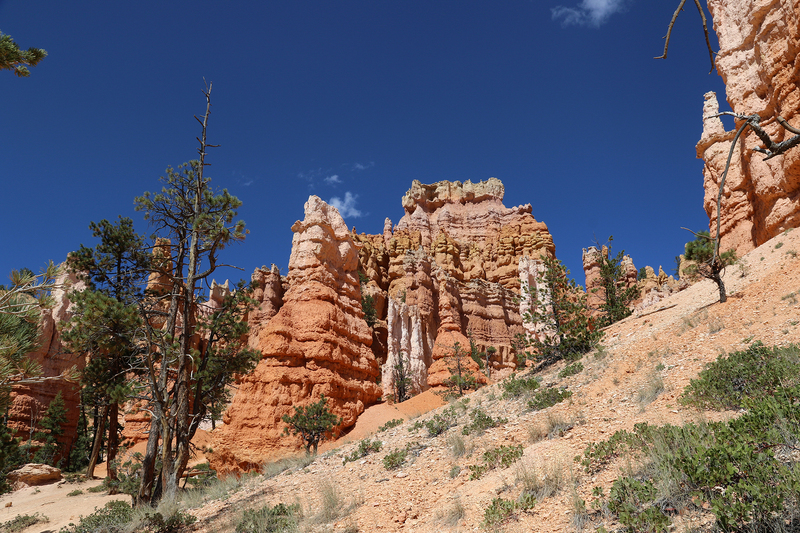 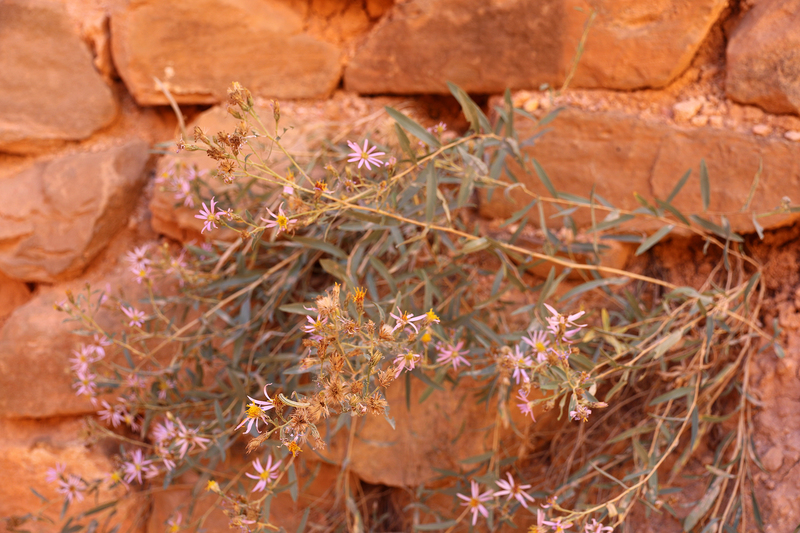 We continued on, and the trail led decidedly into the hoodoos and walls of the Silent City. 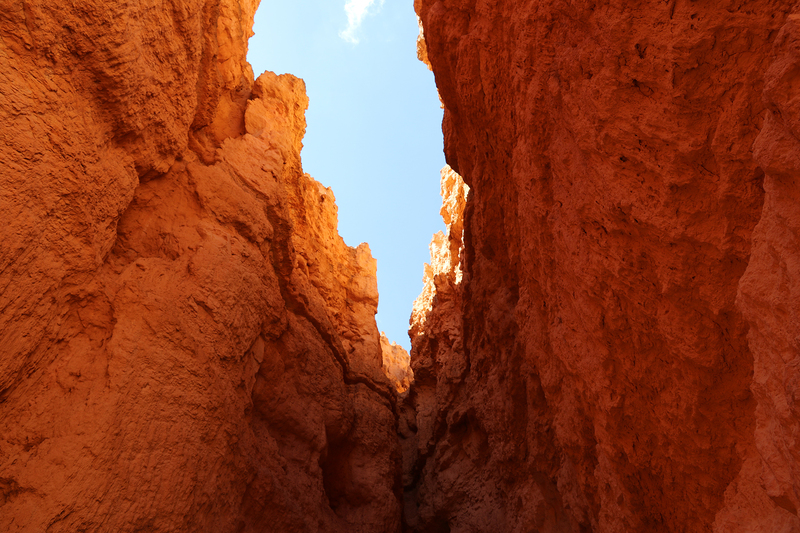 The bottom of Wall Street was a narrow slot canyon-like route between two walls of hoodoos that extended from near the rim beneath Sunset Point. 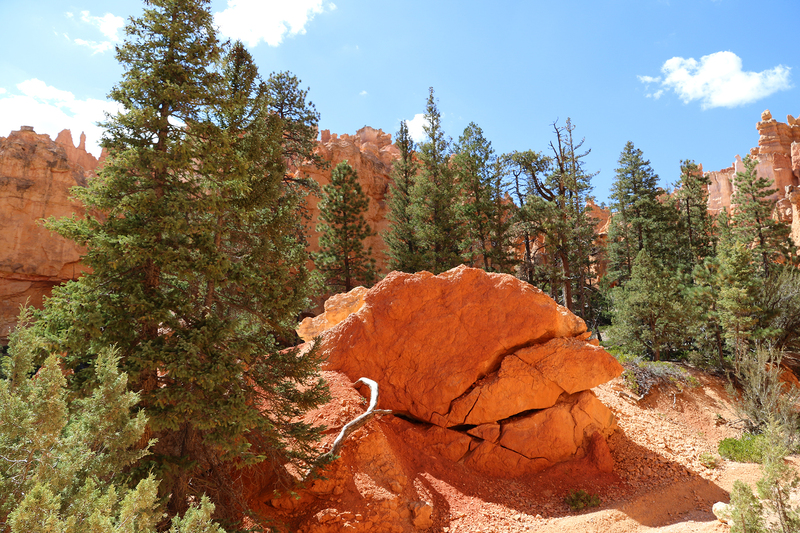 Huge boulders from a 2006 rockslide littered the trail near its narrowest point. 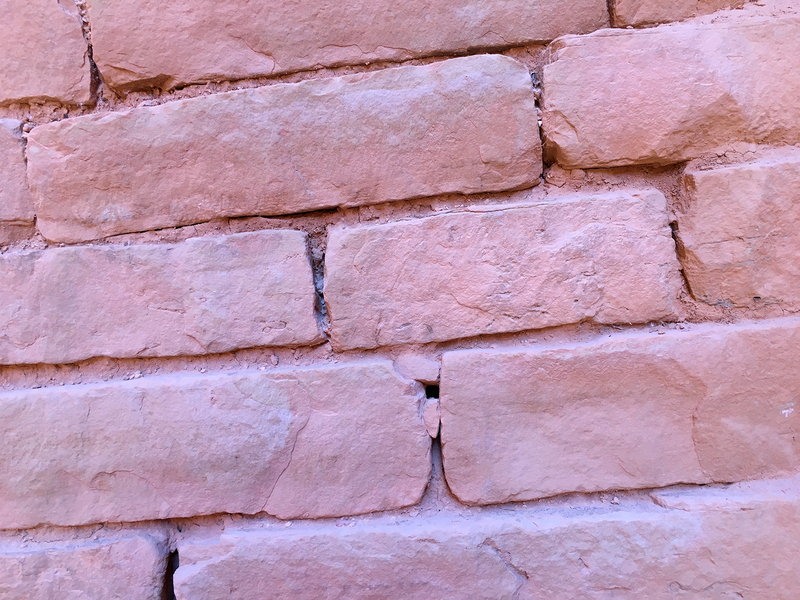 Wooden beam stairs allowed passage around the obstacle. 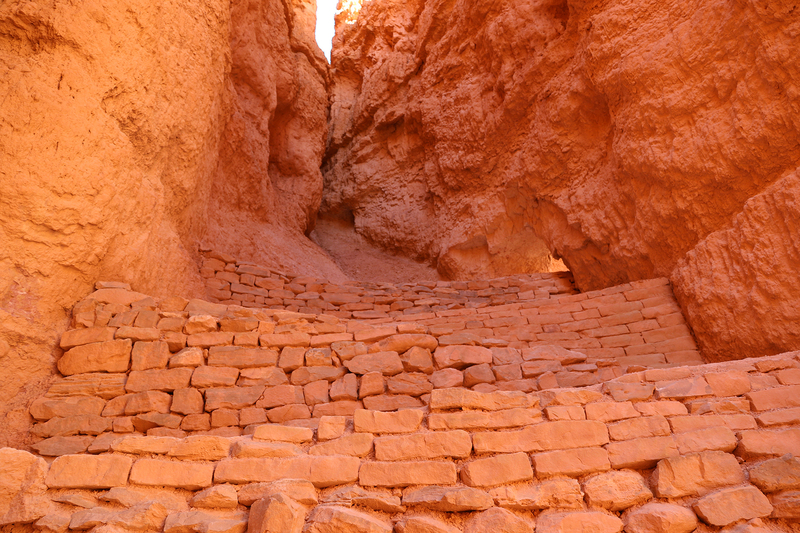 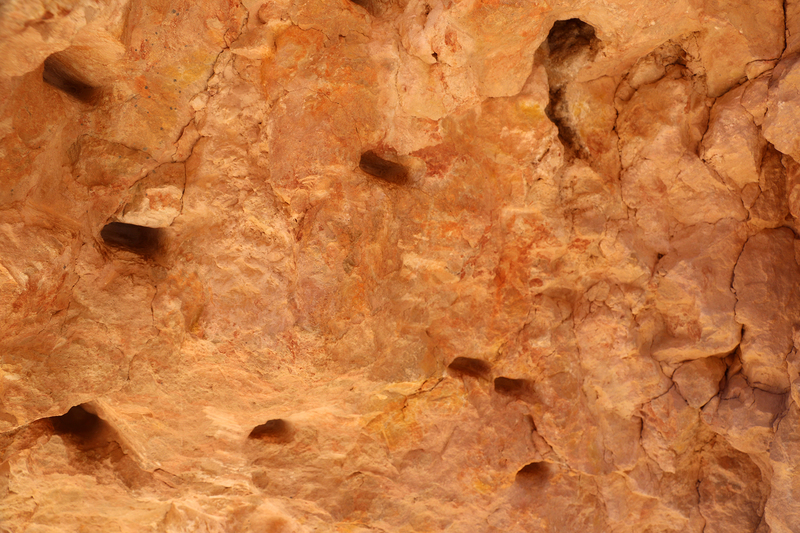 It is easy to imagine a time when enough rock eroding from the hoodoo walls above will close Wall Street entirely. 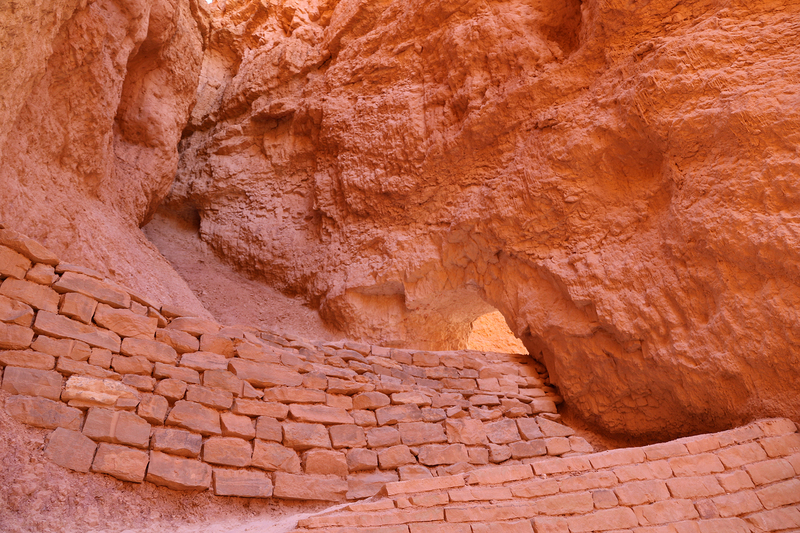 The switchbacks were kept sturdy by brick retaining walls, which must have been made from the limestone of the Pink Cliffs. 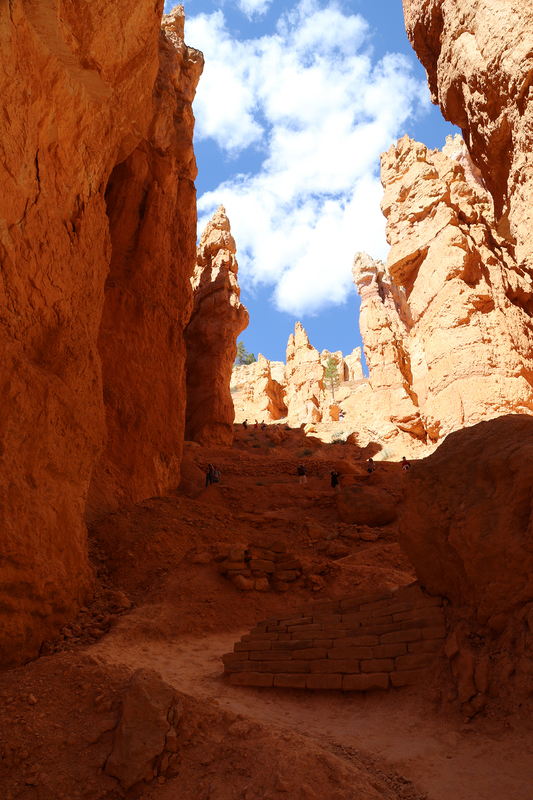 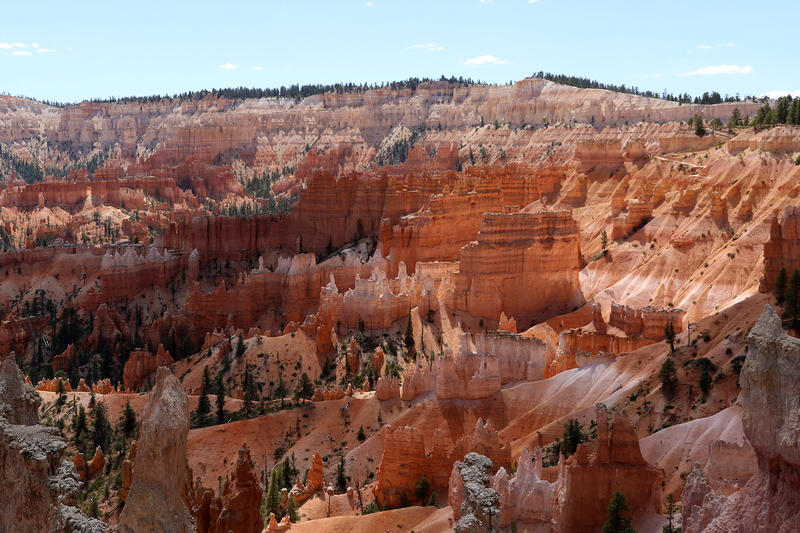 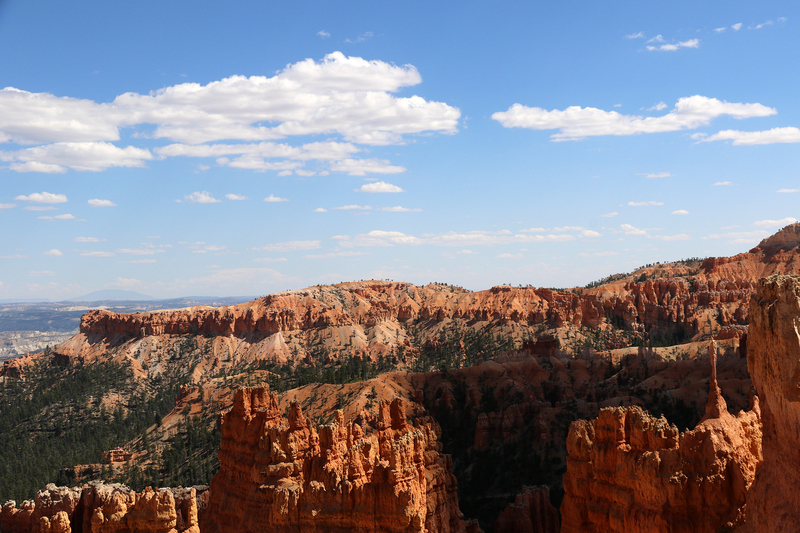 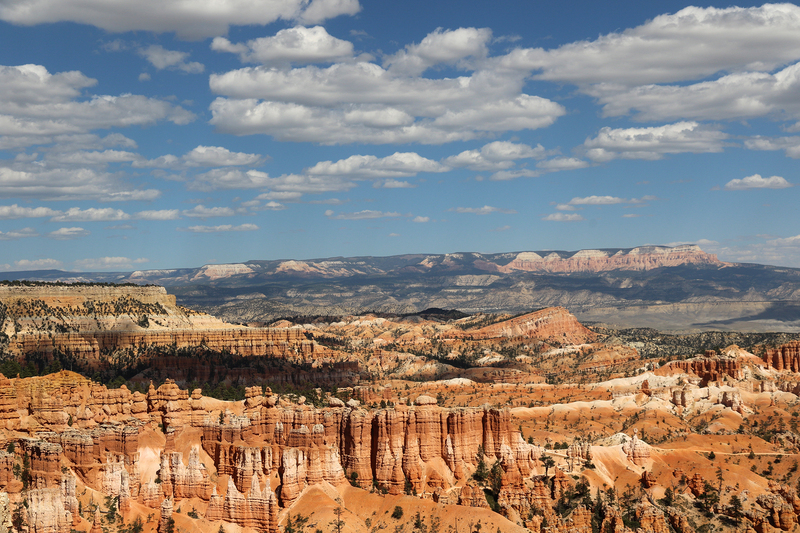 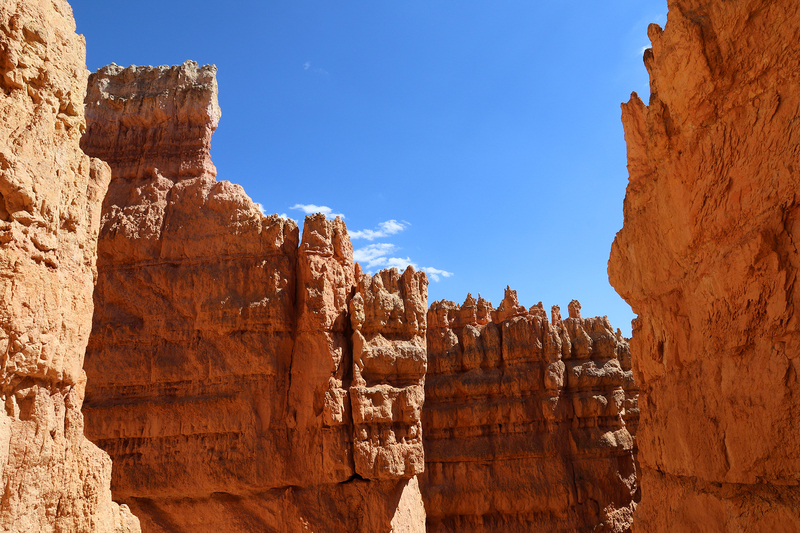 The higher we climbed, the more views we got of the wider Bryce Amphitheater beyond Wall Street and the Silent City. 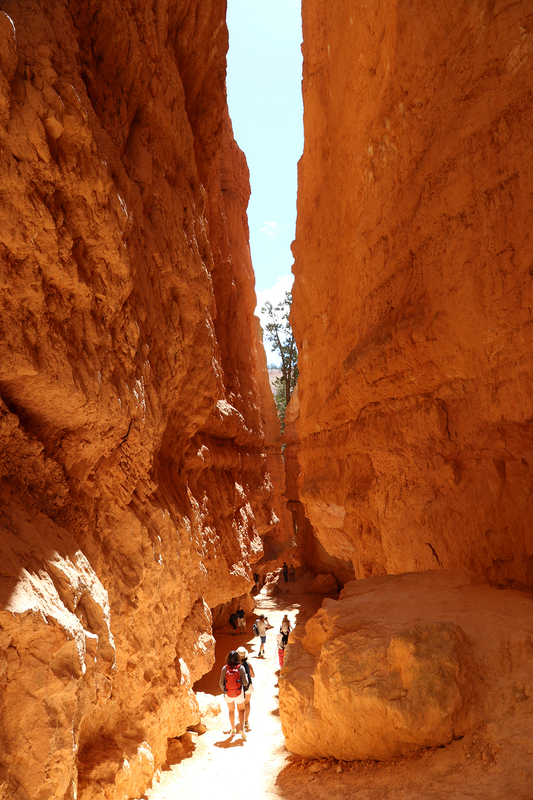 Over two-thirds of the way up, the trail shifted decidedly to the left (going uphill) to take advantage of a space between two hoodoo walls for a series of short switchbacks tucked over to the side of the main Wall Street canyon. 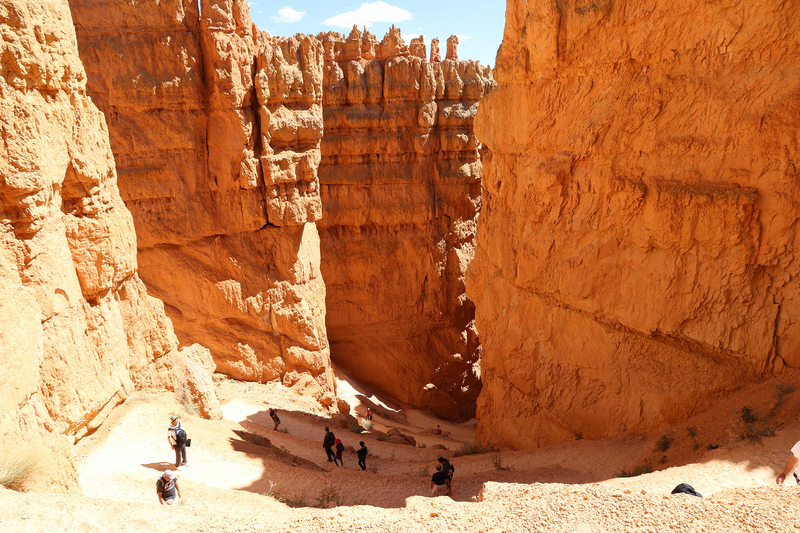 At the top of this little series of switchbacks, hikers had to crouch through a low arch as the trail then made a long sweep above Wall Street. 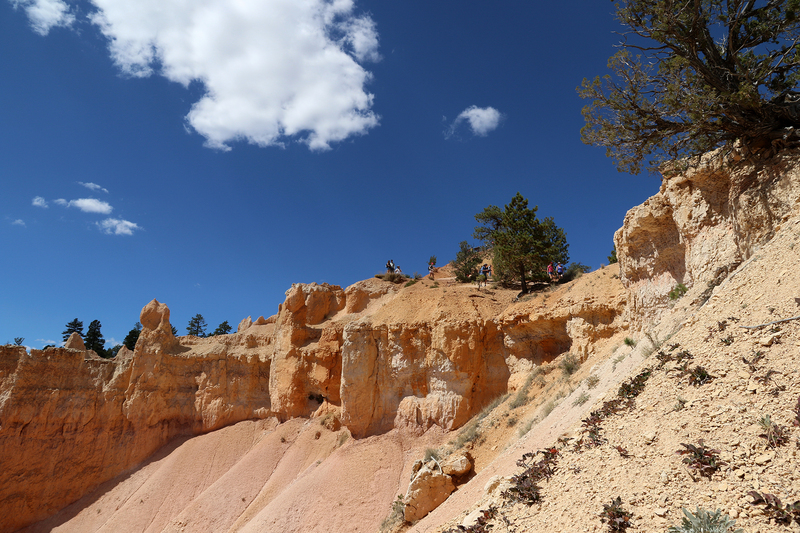 It was an ingenious bit of trail design, allowing for some rapid vertical gain tucked away out of sight, but also fun to hike up. 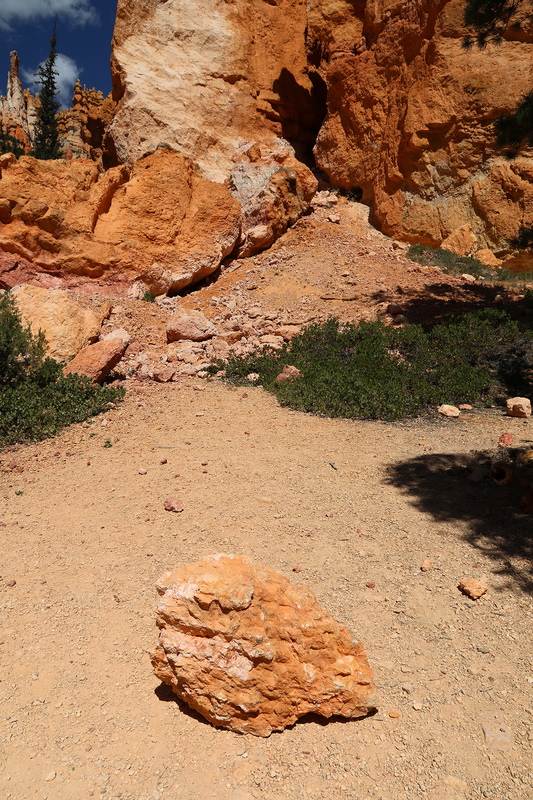 The closer we got to the top, the switchbacks got looser and grade grew steeper, as you can see in the photo above. 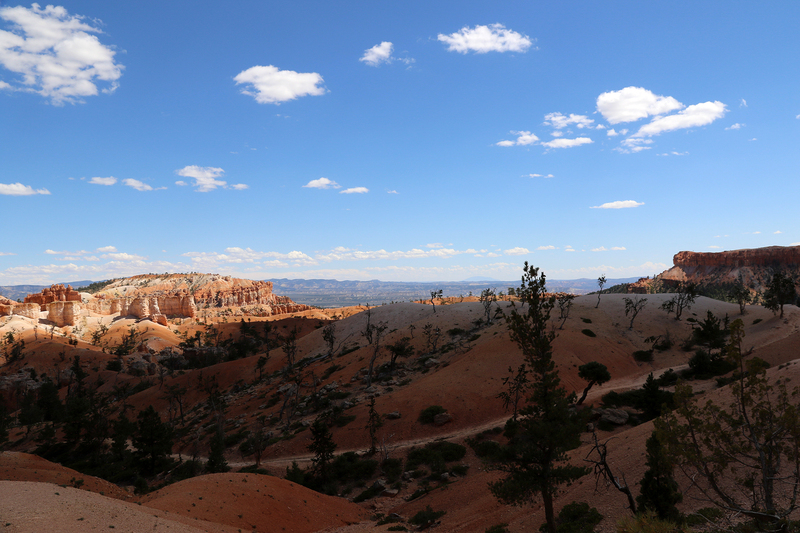 Soon we were topping out as Boat Mesa, Aquarius Plateau, and various points on the rim came into view. 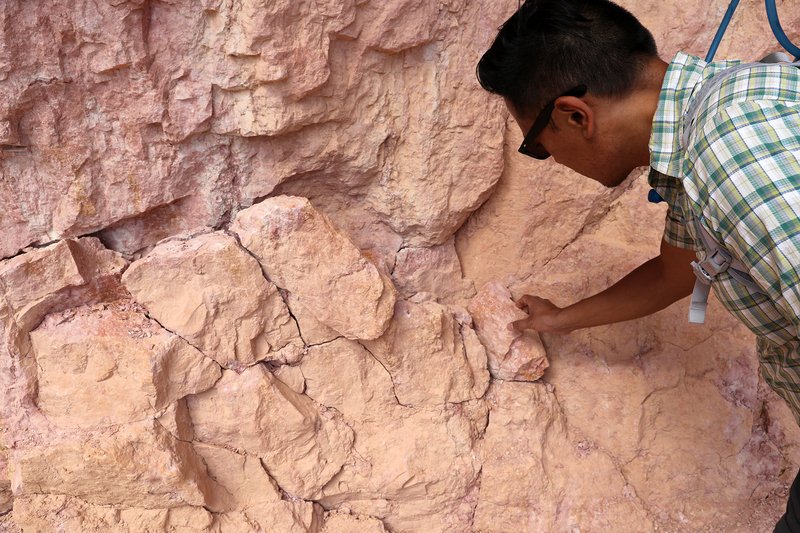 Pink Cliffs limestone, which Sean was able to pick up and set back into place. 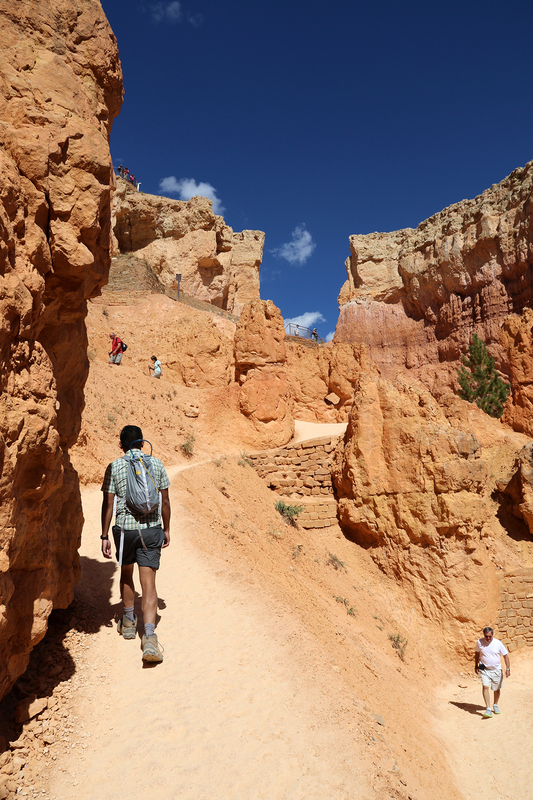 All told, I couldn’t have been happier that we’d capped off our hiking time at Bryce Canyon with the journey up Wall Street. 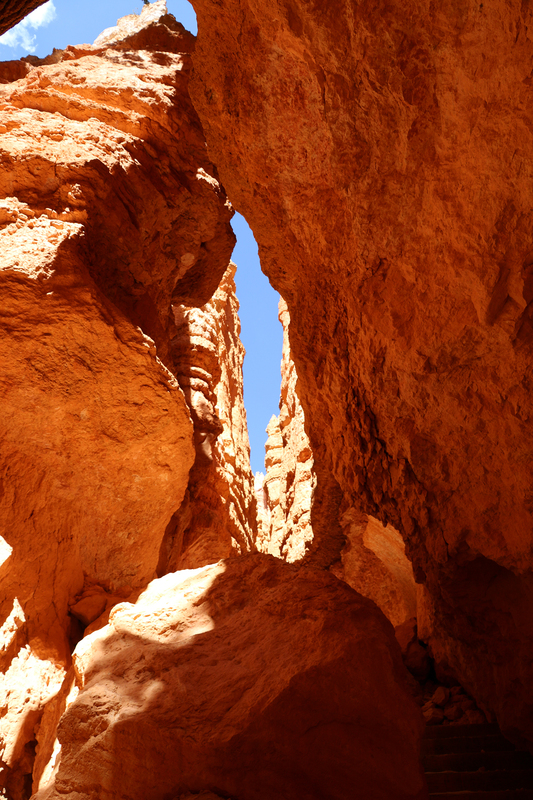 It had been an unplanned, totally unexpected surprise. 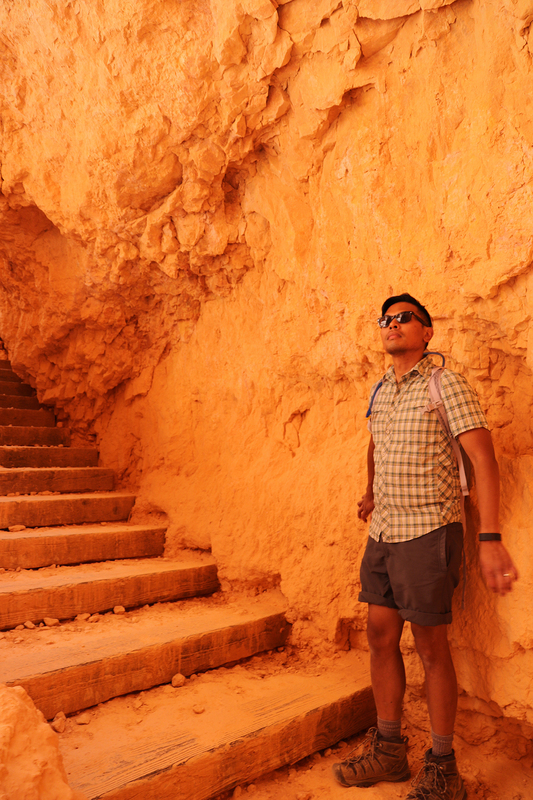 And I’m glad we went up it and not down, even though it was a tough climb, because the blend of beauty and exertion felt just right. 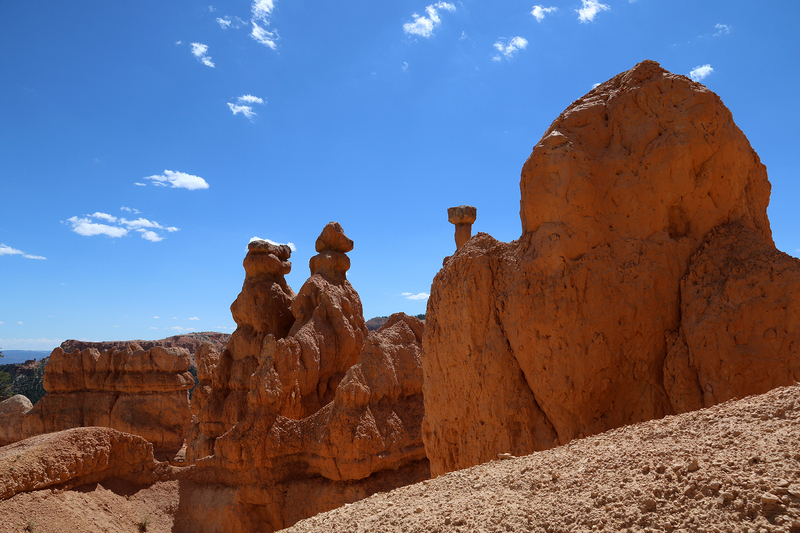 At the top of the trail, we looked around one last time at the iconic landscapes and formations of this National Park that had fueled my youthful daydreams. 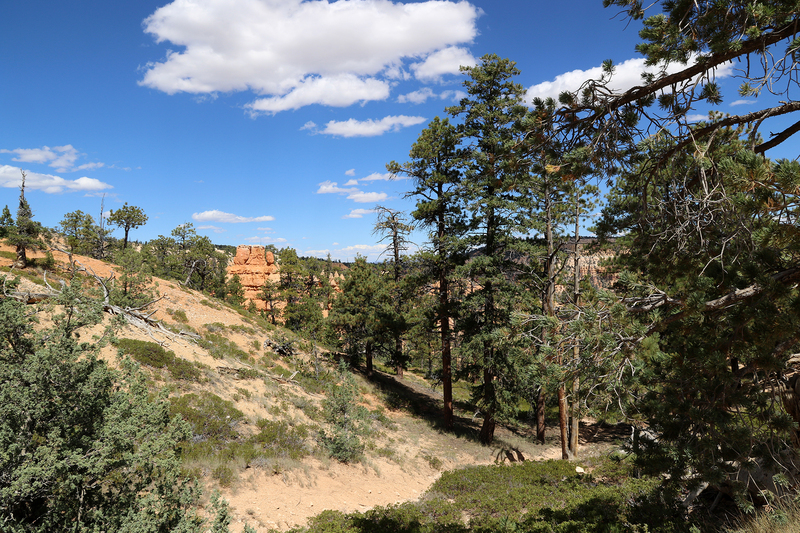 We’d logged 18.85 miles of hikes in the Park in fewer than two days, while still enjoying some scenic drives and time spent lounging in our hammocks. 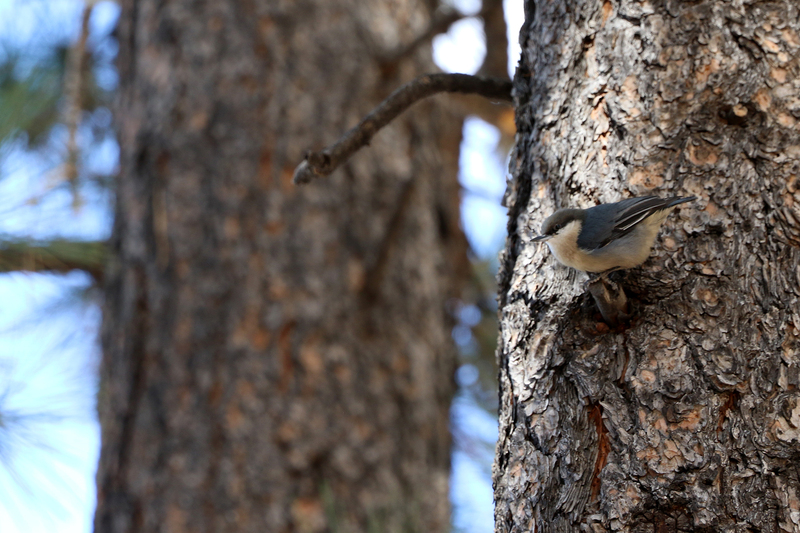 Walking back to the Jeep, we spied a Pygmy Nuthatch in almost the same spot we’d seen a Mountain Bluebird the previous day. 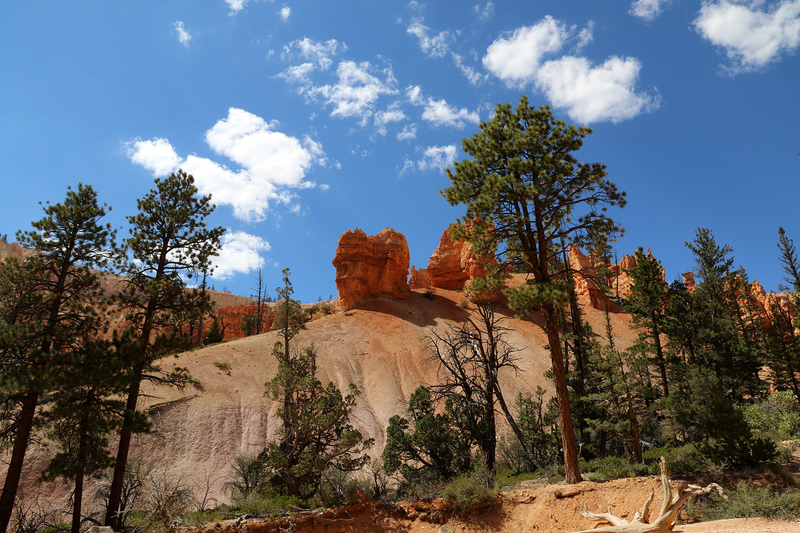 It was approaching 3pm by the time we got back into the Jeep, and we were getting hungry. 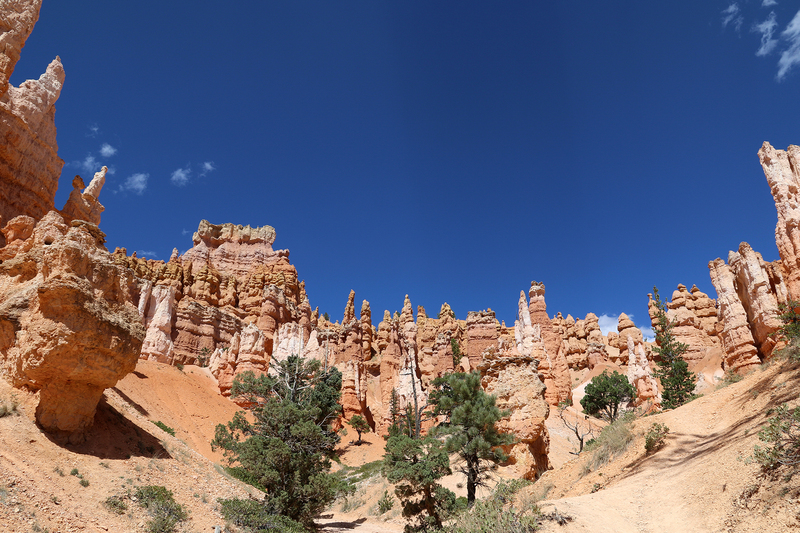 We still needed to stop at the Visitor Center. 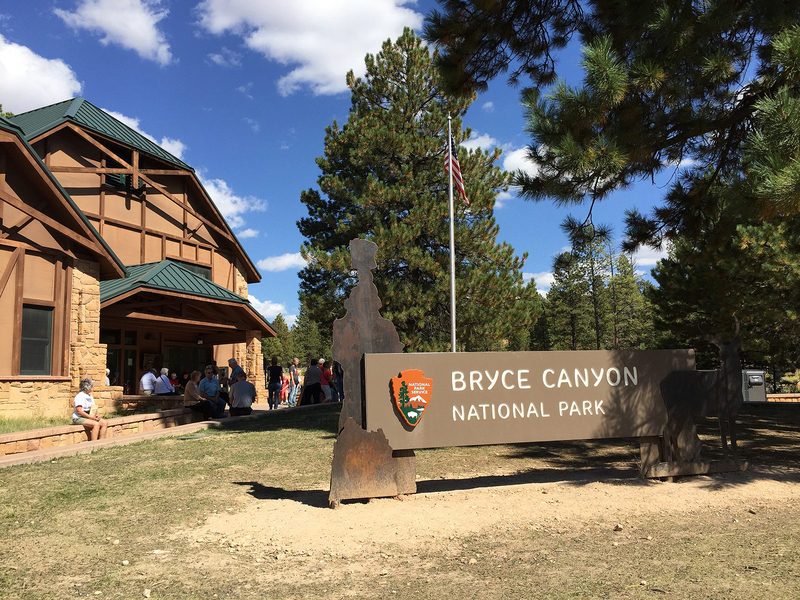 Although we’d stamped our National Park Passports already, we needed to get our patches, pins, and books. 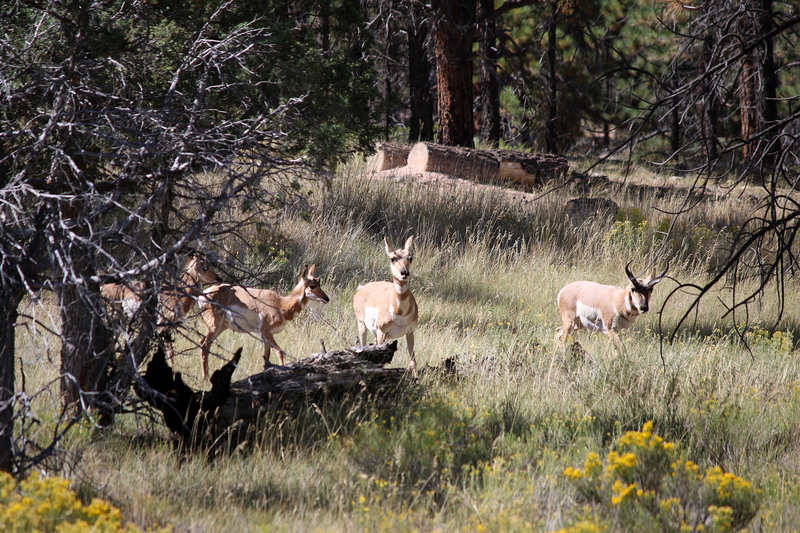 Near the Park Road not far from the Visitor Center we spotted an entire family of Pronghorn, an adult male, an adult female, and two juveniles. 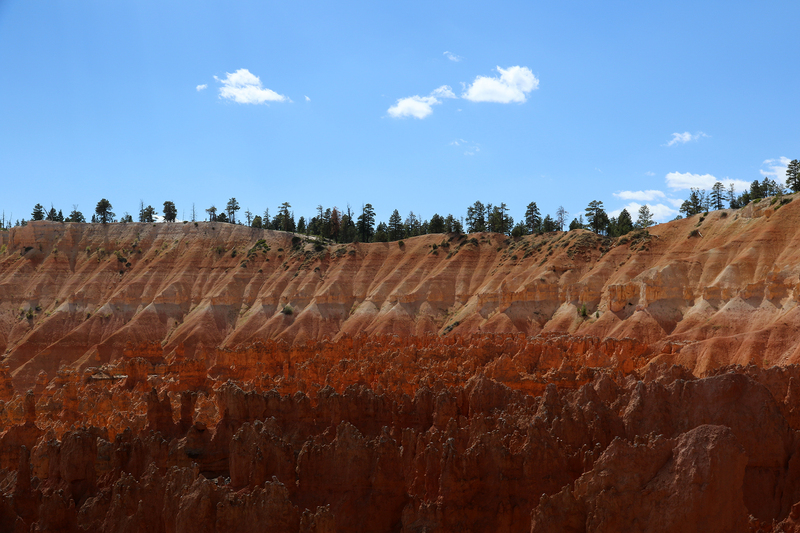 We pulled over and grabbed binoculars and telephoto lens. 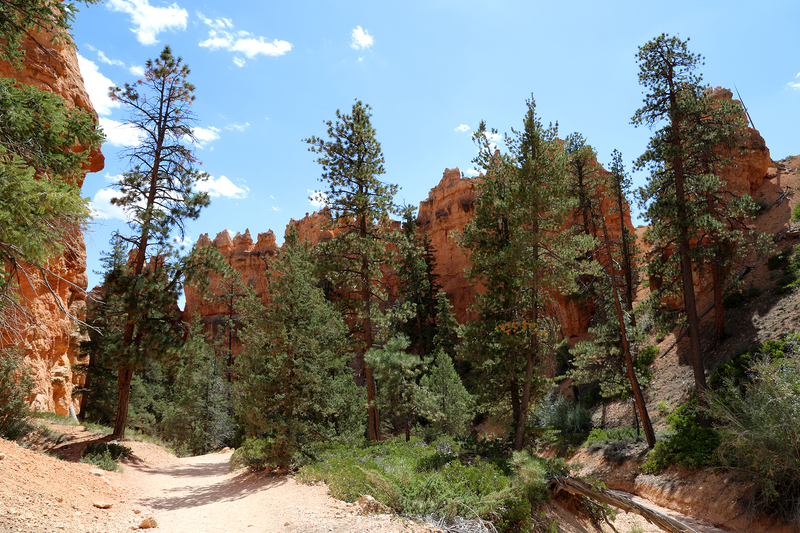 They browsed in a grassy area along the edge of woodland. 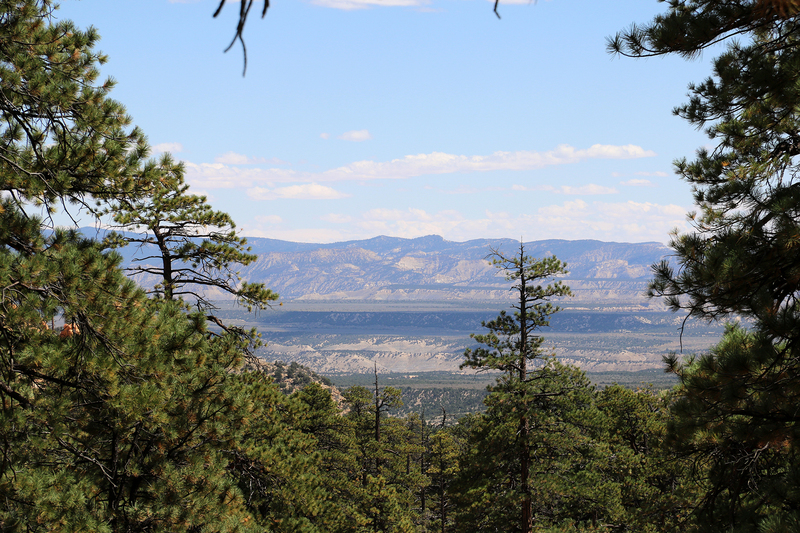 Other visitors stopped, and there were maybe half a dozen cars pulled over with people watching them when suddenly the Pronghorns started running and vanished in the woodlands near Boat Mesa. 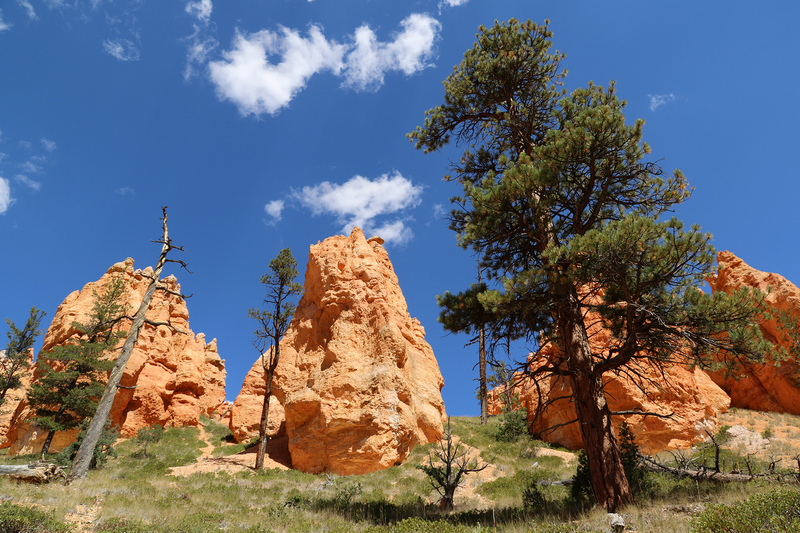 Pronghorn are the fastest land animals in the Western Hemisphere and are thought to be the second-fastest land animals on the planet after Cheetahs. 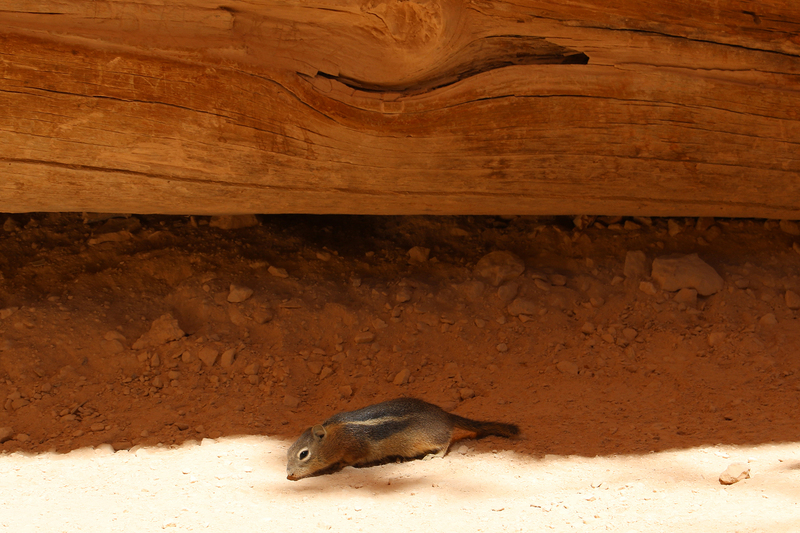 It can sustain speeds of fifty-five mph for half a mile. 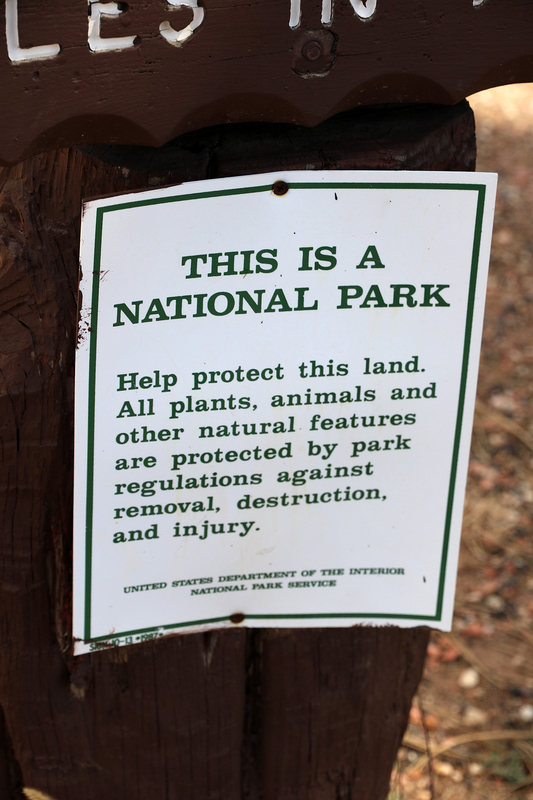 After witnessing the Pronghorn’s sprint, we continued to the Visitor Center where we made our purchases. 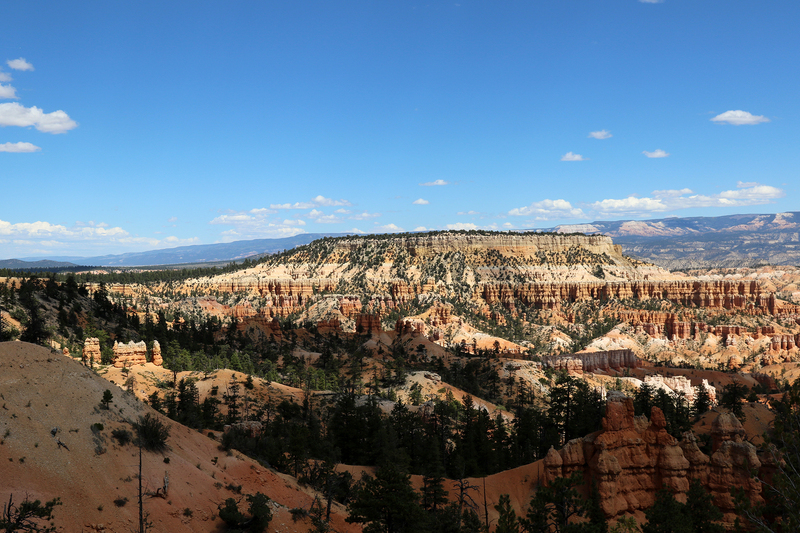 Then we said goodbye to Bryce Canyon National Park, ready to continue descending the Grand Staircase. 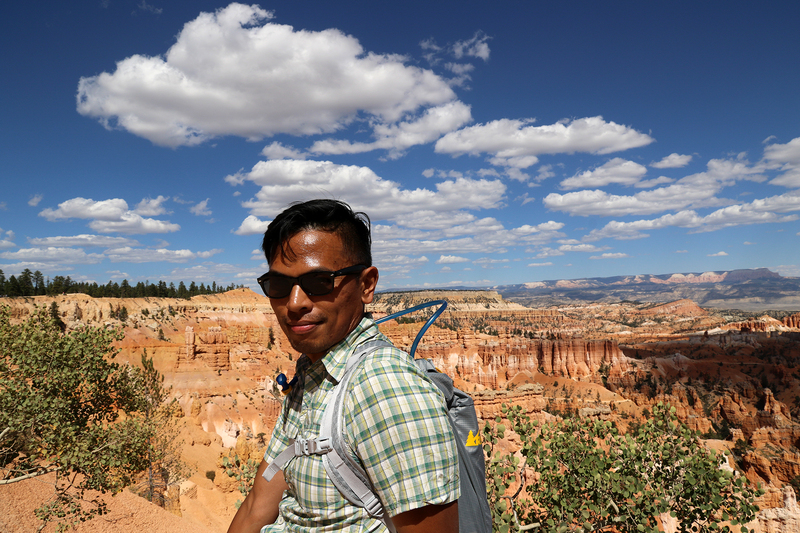 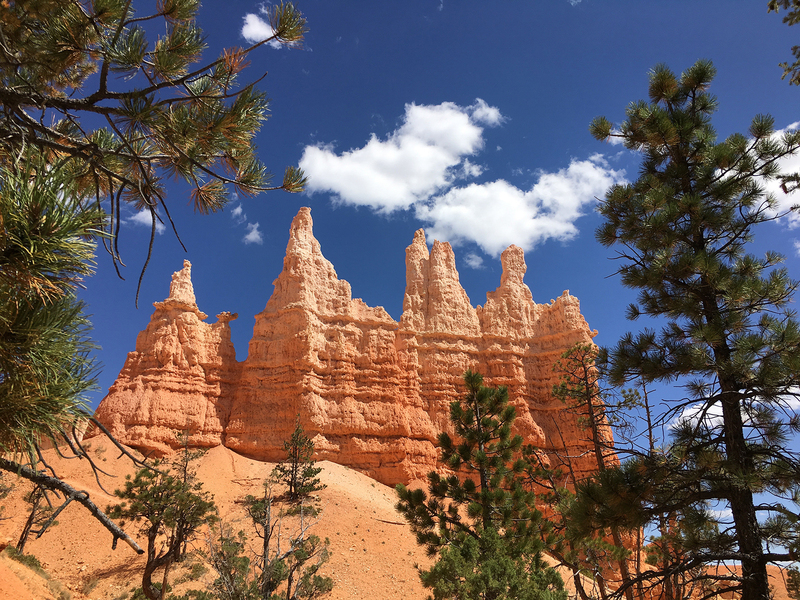 This entry was posted in Journey and tagged Bryce Canyon, Day Hike, Grand Staircase, Utah on June 10, 2017 by Brandon Hayes.